Desai And M. L. Chaturvedi, JJ. For the Applicant :- Gopi Krishna Sahai; S.C. Khare; M.N. Shukla and Khuswaqt Rai, Advocates. For the Opposite Parties :- K.L. Misra, Advocate-General and Sri Ram, Dy. Govt. Advocate. A.K. Gopalan v. State of Madras, AIR 1950 SC 27 (B). Ajaib Singh Lehna Singh v. State of Punjab, AIR 1952 Punj 309 (FB). American Communications Asso. v. Douds, (1949) 339 US 382. In (1924) 268 US 652. Basudeva v. Rex, AIR 1949 All 513 (FB). Benjamin Gitlow v. State of New York, (1924) 268 US 652; (1930) 283 US 359. Bridges v. California, (1941) 86 Law Ed. 192 at p.203. Brij Bhusan v. State of Delhi, AIR 1950 SC 129. Chintaman Rao v. State of Madhya Pradesh, AIR 1951 SC 118, at p.120 . Dilbagh Singh v. Emperor, AIR 1944 Lah 373. Herndon v. Lowry, (1936) 301 US 242 at p.259. King v. Aldred, (1909) 22 Cox C.C 1. Lakhan Singh v. Balbir Singh, AIR 1953 All 342. Lalu Gope v. The King, AIR 1949 Pat 299. Machindar Shivaji v. The King, AIR 1950 FC 129. Masses Pub. Co. v. Patten, (1917) 244 Fed 535 at p.540. Ram Singh v. State of Delhi, AIR 1951 SC 270. Rex v. Basudeva, AIR 1950 (FC) 67 (R). Romesh Thappar v. State of Madras AIR 1950 SC 124, at p.129. Schenck v. United States, (1918) 249 US 47. Schneider v. Irvmgton, (1939) 84 Law Ed.155, at p.165. Sodhi Shamsher Singh v. State of Pepsu, AIR 1954 SC 276. State of Punjab v. Ajaib Singh, AIR 1953 SC 10 ). State v. Ahmed Ali, AIR 1951 All 459. Stromberg v. California, (1930) 283 US 359 at p.369. Swami Hariharanand Saraswati v. The Jailor I/C, District Jail, Banaras, AIR 1954 All 601. Terminiello v. Chicago, (1948) 337 US 1. Terminiello v. Chicago, at p.1134 of Law Ed.). Terminiello v. Chicago,, and (1939) 310 US 88. Thornhill v. State of Alabama, (1939) 310 US 88 at p.97 (I). 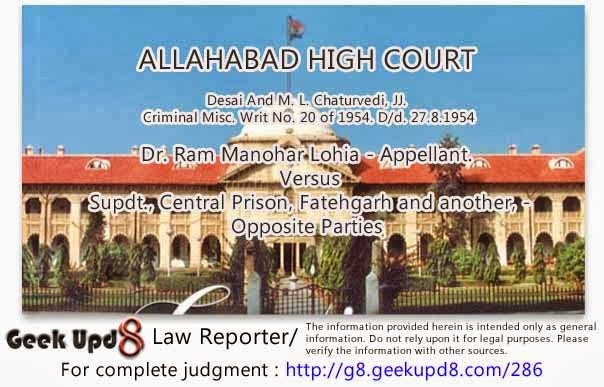 Desai, J.:- This is an application by Dr. Ram Manohar Lohia for a writ of 'habeas corpus'. He is being prosecuted on two charges, each of committing an offence under Section 3, U.P. Special Powers Act, 14 of 1932. He contends that the Act, and particularly Section 3 of it, stands repealed under Article 13 of the Constitution on account of its being inconsistent with the provisions of Article 19. 2. The applicant is the General Secretary of the Praja Socialist Party of India. The Government of Uttar Pradesh has increased irrigation rates for water supplied from canals to cultivators and the Praja Socialist Party of Uttar Pradesh is carrying on an agitation against the increase on the ground that it places an unbearable burden upon the cultivators who are adversely affected by the progressive fall in prices of foodgrains. The applicant visited Farrukhabad in connection with the agitation and addressed two public meetings on 4-7-54, one at Kaimganj at 4 p.m. and the other at Farrukhabad at 8-30 p.m. in the speeches he incited cultivators not to pay "the enhanced irrigation rates" to Government. He also severely criticised the State Government; but we are not concerned with that criticism as it does not form the basis of the charges which he has to answer at the trial. The Station Officer, Kaimganj, followed him from Kaimganj to Farrukhabad and lodged a report against him for the offence under Section 3, U.P. Special Powers Act, at police station, Farrukhabad, and asked the Station Officer, Farrukhabad, in writing to arrest him. Consequently the Station Officer, Farrukhabad, arrested the applicant the same day at 10 p.m. and informed him of the reason for the arrest and showed him the written authority. Just then there arrived Sri. A.H. Drummond, City Magistrate of Farrukhabad and Sub-Divisional Magistrate of Kaimganj; the Station Officer produced the applicant before the City Magistrate there and then and the City Magistrate granted a remand for two days. The applicant was then sent to the District Jail. The Station Officer after investigation submitted a charge-sheet against the applicant for two offences, each of S.3, for making the two speeches in the Court of Sri. P.R. Gupta, a Judicial Officer, where the case is pending. The Magistrate went to the jail on 6-7-'54 to try the applicant who protested against his trial within the jail premises. The Magistrate rejected the protest. Then the applicant made an application for referring the case to the High Court under Section 432, Criminal P.C., and that application also was rejected. Thereupon the applicant applied for an adjournment of the case on the ground that he wanted to move this Court for transfer of the case and the Magistrate adjourned it to 7-8-'54. Though the offence of Section 3 is bailable, the applicant has not applied for bail. He filed the present application on 9-7-1954. 3. The only grounds urged by the applicant are that the Act is 'ultra vires' because it contravenes Article 19 of the Constitution and that his arrest and detention are illegal and contrary to Article 21 of the Constitution. Two counter-affidavits have been filed in reply to the application, one by the Assistant Jailor of the Central prison where the applicant is being confined at present and the other by the Station Officer of police station, Farrukhabad. The Assistant Jailor affirms that the applicant has been arrested for the offences of Section 3 of the Act, that he was produced before the Court inside the jail on 6-7-54, that the case was adjourned to 19-7-1954, and that he is being confined in the jail under the orders of the Judicial Officer. The Station Officer, police station Farrukhabad, in his counter-affidavit mentions the circumstances in which the applicant was arrested and affirms that he is being confined as an under-trial on charges of Section 3 of the Act. 4. Though the applicant mentioned Article 21 as having been contravened by his detention in the jail, he meant to rely on Article 22. Under that Article a person on being arrested must be informed of the grounds for his arrest and must be allowed the right to consult and he defended by a legal practitioner; also he must be produced before the nearest Magistrate within 24 hours and no arrested person can be detained in custody beyond 24 hours without the authority of a Magistrate. I find that none of these provisions was infringed in the present case; the applicant was informed of the reasons for his arrest by the Station Officer, Farrukhabad, at the time of the arrest and was produced there and then before a Magistrate and had been detained from the date of his arrest in custody with the authority of one Magistrate or another. Sri A.H. Drummond remanded him to custody for two days on 4-7-54 and Sri P.R. Gupta commenced his trial in the jail on 6-7-'54 and, when adjourning it to 19-7-'54, passed an order for continuing his detention in the jail. In the warrant directing the Superintendent of the Central Jail to keep him in custody, the Magistrate has ordered that he should be produced before him in Court on 19-7-'54. It amounts to his authorising the applicant's detention in jail custody. Ordinarily Magistrates write in the order-sheet of the case, when adjourning it to the next date, that the accused should remain in custody as before; but Sri P.R. Gupta or rather his clerk did not say in the order passed on 6-7-'54 that the applicant should remain in custody up to 19-7-'54. That omission does not matter when the warrant contains the magistrate's authority for the detention. One authority for detention is enough. Moreover whether there existed any magisterial authority for detaining the applicant in custody after 6-7-'54 or not is a question of fact which cannot be permitted to be raised for the first time in argument. Had it been the applicant's case that there existed no authority, he should have alleged it in the affidavit and given an opportunity to the opposite party to contest the allegation. He simply pleaded in his application that his detention contravened the provisions of Article 21 without stating the facts constituting the contravention. 5. Sri S.C. Khare contended that the applicant was not produced before a Magistrate within 24 hours of his arrest within the meaning of Article 22. His argument was that Sri A.H. Drummond went to the spot of arrest of the applicant in his capacity of an executive officer (probably to see that there was no disturbance of public order) and not to exercise any judicial or magisterial functions such as of granting a remand and authorising the detention of an arrested person in custody. It is true that Sri A.H. Drummond and the Sub-Divisional Magistrate, Kaimganj, closely followed the Station Officer of Farrukhabad when he proceeded to arrest the applicant and arrived at the place of arrest within a few minutes of the arrest, They might have gone there for the purpose of seeing that the arrest did not result in any disorder. They might have gone there to exercise their executive authority. But it cannot be disputed that they had also magisterial powers and were not prevented from exercising them if an occasion arose for the same, merely because they had gone to the place primarily for the purpose of exercising executive powers. There were absolutely no restrictions upon the exercise of magisterial powers by Sri. A.H. Drummond and when the Station Officer, Farrukhabad, produced the arrested applicant before him, he was fully competent to authorise his detention in custody within the meaning of Article 22. 'Swami Hariharanand Saraswati v. The Jailor I/C, District Jail, Banaras', AIR 1954 All 601 on which Sri Khare relies does not support his contention at all. There the Swami was arrested by a Magistrate inasmuch as he was taken into custody by the police under his orders and under his direct supervision, and was produced before the same Magistrate who remanded him to custody; and it was held that he should have been produced before another Magistrate. A person can be arrested not only by a police officer, but also by a Magistrate. If he is arrested by a police officer, he must be produced before the nearest Magistrate within 24 hours. If he is arrested by a Magistrate, then also he must be produced within 24 hours before the nearest Magistrate, that is, before another Magistrate. There is nothing to suggest that Article 22(2) will not apply if the arrest is made by a Magistrate. Since it must apply also to an arrest by a Magistrate, the arresting Magistrate must produce him before the nearest Magistrate. He cannot refuse to produce him before another Magistrate by saying that he has produced him before himself as a Magistrate. This argument would amount to not applying the provision to an arrest by a Magistrate. If a person arrested by a Magistrate is not required to be produced before another Magistrate by reason of the fact that the person arresting him is himself a Magistrate, it would mean that the arresting Magistrate has to do nothing after arresting him, in other words, that he is not bound by Article 22(2). The Magistrate who arrested the Swami was, therefore, bound by Article 22(2) to produce him before the nearest Magistrate, that is, before another Magistrate. In the present case, the arrest was not made by Sri A.H. Drummond, nor was it made under his orders or supervision. It was the Station Officer, Farrukhabad, who had arrested him on his own authority, and he could be produced before Sri A.H. Drummond who, being at the spot, was the nearest Magistrate. Therefore, full compliance with the provision of Article 22(2) was done. "All citizens shall have the right to freedom of speech and expression." "reasonable restrictions on the exercise of the right in the interests of the security of the State, public order, decency and morality, or in relation to contempt of Court, defamation or incitement to an offence." (2) Whether the impugned Act is inconsistent with, or restricts the applicant's right to, freedom of speech and expression? (4) Is the restriction reasonable?" "As the preventive detention order results in the detention of the applicant in a cell it was contended on his behalf that the rights specified in Article 19(1) (a), (b), (c), (d), (e) and (g) have been infringed. It was argued that because of his detention he cannot have a free right to speech as and where he desired and the same argument was urged in respect of the rest of the rights mentioned in sub-clause (b), (c), (d), (e), and (g). Although this argument is advanced in a case which deals with preventive detention, if correct, it should be applicable in the case of punitive detention also to any one sentenced to a term of imprisonment under the relevant section of the Indian Penal Code." "......the legislation to be examined must be directly in respect of one of the rights mentioned in the sub-clauses. If there is a legislation directly attempting to control a citizen's freedom of speech or expression, or his right to assemble peaceably and without arms, etc., the question whether that legislation is saved by the relevant saving clause of article 19 will arise. If, however, the legislation is not directly in respect of any of these subjects, but as a result of the operation of other legislation, for instance, for punitive or preventive detention, his right under any of these sub-clauses is abridged, the question of the application of Article 19 does not arise. The true approach is only to consider the directness of the legislation and not what will be the result of the detention otherwise valid, on the mode of the detenu's life." "Reading Article 19 as a whole, therefore, it seems to me that that it has no application to a legislation dealing with preventive or punitive detention as its direct object." "......Art.19 guarantees to the citizens the enjoyment of certain civil liberties while they are free." "......this would not make the law providing for preventive detention a legislation taking away or abridging the rights under Article 19 (1) (g) of the Constitution........"
"On the other hand, Articles20, 21 and 22 are primarily concerned with penal enactments or other laws under which personal safety or liberty of persons could be taken away in the interests of the society and they set down the limits within Which the State control should be exercised." he only meant that the validity of a penal enactment not directly infringing the rights enumerated in Article 19 depends upon the provisions of Articles20, 21 and 22. If the penal enactment does not directly infringes the rights but an infringement arises incidentally out of an action taken under it, its validity is not affected thereby. The Preventive Detention Act, 1950, does not directly infringe the rights mentioned in Article 19 and is not inconsistent with it. If on account of an action taken under it (e.g. detention under Section 3) a person is deprived of certain freedom, that is only an incidental effect of the working of the Act and the Act cannot be said to be inconsistent with Article 19. The quintessence of the decision in the case is that arresting a person, whether for doing something or for preventing him from doing something, is not infringing any of the rights conferred by Article 19(1). The Constitution makes a distinction between the right of personal liberty and the right of freedom of speech, expression, trade, forming association, interstate movement, acquring property etc. Only the former is infringed by confinement or detention which is nothing but confining within four walls and not allowing to go out without permission. This is certainly a restriction on movements, but it does not infringe the rights mentioned in Article 19(1)(d), which is the right of moving freely from one State to another. Depriving a person of his personal liberty (by arrest) does not deprive him of the rights conferred by Article 19(1), which in theory, he can still exercise. If he cannot utter some words or cannot hold certain property or cannot practise a profession while he is in confinement, it is the result not of the confinement but of the prison regulations. The prison regulations may be said to prejudice his rights tout not the confinement. Therefore A.K. Gopalan's grievance that on account of his detention he was deprived of the rights enumerated in Article 19 was without substance. The present case is different from - 'A.K. Gopalan's case '. The applicant's contention is that the Special Powers Act itself infringes the freedom of speech and expression; he complains of the arrest on the ground that the Act under which he was arrested is unconstitutional and not on the ground of any consequences arising out of his detention. He could have complained about the unconstitutionality of the Act even if he had not been arrested, or had been released on bail. A.K. Gopalan was not detained by way of punishment for any speech made by him; he was detained in order that he might not act prejudicially to the public safety and the maintenance of public order. If a person is punished for a certain speech, it means that the freedom of speech is directly abridged; but the same cannot be said if he is detained so that he may not speak to a certain manner. In - 'Ram Singh v. State of Delhi', AIR 1951 SC 270, the decision in - 'A.K. Gopalan's case ' was followed and the Act was held constitutional, even though it allowed Ram Singh's detention with the express object of preventing him from making certain speeches. Section 3 may contemplate that a person is to be detained so that he may not make certain speeches, still it cannot be said to be a provision directly affecting the freedom of speech and consequently inconsistent with Article 19(1). I find that there is no reason, and no authority, for saying that the bare fact that an action taken under a certain enactment results in a person's being deprived of his personal liberty, prevents him from challenging the constitutionality of the provision on the ground of its being inconsistent with Article 19. "the true position in regard to the scope and nature of a petition of 'habeas corpus' excludes the possibility of a challenge in regard to the constitutionality of an enactment. It is clear that the petitioners can challenge the validity of the impugned Act in proceedings which have been initiated under the Act against them. They have, therefore, another and a more appropriate remedy open to them for that purpose." "If the law which defines the offence and prescribes its punishment is void, the court was without jurisdiction and the prisoners must be discharged." "The unconstitutionality of a statute or ordinance under which a person is detained generally is ground for relief on 'habeas corpus'." "If it appears clearly that the act for which the party is committed is no crime,........... the Court discharges him." upon the return to the writ of 'habeas corpus'; see Halsbury's Laws of England, 2nd Edn., Vol.9, Section 1215. I have not come across any authority stating that a 'habeas corpus' application cannot lie on the ground of invalidity of an Act. It is, therefore, not correct to say that the scope and nature of a petition of 'habeas corpus' excludes the possibility of a challenge in regard to the constitutionality of an Act. In the end I should mention that the learned Advocate General did not plead that this Court had no jurisdiction to enter into the question of the constitutionality of the Act in these proceedings. 9. Every supply of canal water is deemed to be given at the rates and subject to the conditions prescribed by the rules made by the State Government, (see Section 31, Northern India Canal and Drainage Act, (1873) ). If any sum lawfully due under the provisions of the Act remains unpaid after the date on which it becomes due, it can be recovered by the Collector from the person as if it were arrears of land revenue under Section 45. Section 70 is the only section dealing with the offences under the Act. It punishes certain acts such as damaging or obstructing canals, interfering with the supply of water, fouling water of a canal and destroying a level mark or water gate, etc., but not the non-payment of any sum due under the Act or inciting its non-payment. Violation of a rule made under the Act, for breach whereof a penalty may be incurred, is also an offence, the non-payment of a sum due under the Act or inciting its non-payment does not violate any rule made under the Act for breach whereof a penalty may be incurred. No penalty is incurred for not paying the sum due under the Act on the date on which it falls due; if it is not paid the Collector can recover it but the defaulter is not subject to any penalty. Therefore, not paying any sum due under the Act, or instigating its nonpayment, is not an offence under the Northern India Canal and Drainage Act. It is not an offence under any other enactment also. "Whoever by words either spoken or written or by signs or by visible representations or otherwise instigates expressly or by implication, any person or class of persons not to pay or to defer payment of any liability, shall be punishable with imprisonment which may extend to six months, or with fine, extending to Rs.250/-, or with both." (7) along with rent of agricultural land. "where a statute is so vague and uncertain as to make criminal an utterance or an act which may be innocently said or done with no intent to induce resort to violence or on the other hand may be said or done with a purpose violently to subvert government, a conviction under such a law cannot be sustained." "Where a law purports to authorise the imposition of restrictions on a fundamental right in language wide enough to cover restrictions both within and without the limits of constitutionally permissible legislative action affecting such right, it is not possible to uphold it even so far as it may be applied within the constitutional limits, as it is not severable. So long as the possibility of its being applied for purposes not sanctioned by the Constitution cannot be ruled out, it must be held to be wholly unconstitutional and void." "The law ........ cannot be held valid because the language employed is wide enough to cover restrictions both within and without the limits of constitutionally permissible legislative action affecting the right." The provision in Section 3 of the Act that instigating a class of persons by spoken words not to pay to Government any sum recoverable as an arrear of land revenue is an offence is distinct and severable from the other provisions in the same section punishing other acts. Its validity does not depend upon the validity of the other provisions. It is not of such a nature as to be valid if applied for one purpose and invalid if applied for another purpose. It does not matter if the applicant instigated the non-payment of only the excess over the irrigation dues that were previously payable by the cultivators. We are not concerned with what the applicant did. Our concern is with the question whether the particular provision is against the Constitution or not. There is nothing to suggest that the disturbance of public order depends upon the nature of the liability, the non-payment of which is instigated. As regards that question, if public order is likely to be disturbed by instigation of non-payment of 'takavi', it is likely to be disturbed by instigation of non-payment of the excess of the irrigation dues. Consequently the unconstitutionality of a provision punishing one act will not affect the constitutionality of another provision punishing another act. The punishment of one act does not depend upon the punishment of another act. The applicant is being prosecuted for the act of expressly instigating by spoken words a class of persons not to pay money recoverable as arrears of land revenue. That act is punishable under Section 3. What we have to see is whether the particular provision of Section 3 penalising that act is inconsistent with Article 19 (1)(a) or not; we are not concerned with the other provisions of the section. Even if they are consistent with Article 19(1)(a), the particular provision penalising the act done by the applicant may be inconsistent and consequently void; on the other hand, the other provisions may be inconsistent and still the particular provision penalising the act may be consistent and consequently be upheld as constitutional. If there is any illegality in any of the provisions penalising an act, it is not a contagious illegality and the other provisions do not become infected by it merely on account of their juxtaposition in the same section or being contained in the same Act. "It is a fundamental principle, long established, that the freedom of speech and of the press which is secured by the Constitution does not confer an absolute right to speak or publish, without responsibility, whatever one may choose, or an unrestricted and unbridled license that gives immunity for every possible use of language, and prevents the punishment of those who abuse this freedom. That a state, in the exercise of its police power, may punish those who abuse this freedom by utterances inimical to the public welfare, tending to corrupt public morals, incite to crime, or disturb the public peace, is not open to question. A state may punish utterances endangering the foundations of organised government and threatening its overthrow by unlawful means. **** It does not protect publications or teachings which tend to subvert or imperil the government, or to impede or hinder it in the performance of its governmental duties." "Freedom of speech thus does not comprehend the right to speak on any subject at any time." "That is why freedom of speech, though not absolute, is nevertheless protected against censorship or punishment, unless shown likely to produce a clear and present danger of a serious substantive evil that rises far above public inconvenience, annoyance, or unrest." "The liberty protected is not the right to perpetrate acts of licentiousness, or any act inconsistent with the peace or safety of the State. Freedom of speech and press does not include the abuse of the power of tongue or pen, any more than freedom of other action includes an injurious use of one's occupation, business, or property." "Judge Hand places outside the limits of free speech one who counsels or advises others to violate existing laws. It is true, he says, that any discussion designed to show that existing laws are mistaken in means or unjust in policy may result in their violation, but if one stops short of urging upon others that it is their duty or their interest to resist the law, he should not be held to have attempted to cause illegal conduct." "A man may lawfully express his opinion on any public matter, however distasteful, however repugnant to others, if of course he avoids defamatory matter or if he avoids anything that can be characterised either as blasphemous or as an obscene libel. Matters of State, matters of policy, matters even of morals - all these are upon to him. ********* if he makes use of language calculated to advocate or to incite others to public disorders, to wit, rebellions, insurrections, assassinations, outrages, or any physical force or violence of any kind, then whatever his motive, whatever his intentions, there would be evidence on which a jury might, on which I think a jury ought to, decide that he is guilty of a seditious publication." 12. But the case is governed not by the law prevailing in America or England, but by the law contained in our written Constitution. When the First and the Fourtheenth Amendments to the American Constitution protect the freedom of speech against interference by the Union and the States, they refer to the freedom of speech as understood at the time of the Amendments and not absolute freedom. Unlike our Constitution, they do not prescribe the limitations on the right of free speech, though no one can have an absolute freedom to say anything he likes at any time or any place. In the interests of the States and the public, there must be some limitations on the right of free speech. Consequently freedom of speech guaranted by the Amendments has got to be understood as subject to implied or inherent limitations. Our Constitution, on the other hand, prescribes the limitations expressly, vide sub-clause (2) of Article 19. When in sub-clause (2) it is stated how far the freedom of speech can be interfered with, it follows that the freedom guaranteed under sub-clause (1) is absolute freedom and that it is not subject to any limitations that are not to be found in sub-clause (2). "It clearly means that the legislation to be examined must be directly in respect of one of the rights mentioned in the sub-clauses." "Liberty has, therefore, to be limited in order to be effectively possessed. Accordingly, Article 19, while guaranteeing some of the most valued phases or elements of liberty to every citizen as civil rights, provides for their regulation for the common good by the State imposing certain 'restrictions' on their exercise." "....none of the seven rights enumerated in clause (1) is an absolute right, for each of these rights is liable to be curtailed by laws made or to be made by the State to the extent mentioned in the several clauses (2) to (6) of that Article." "It must be taken as a command of the broadest scope that explicit language, read in the context of a liberty-loving society, will allow". With reference to Article 19(1), I would say that it must be taken as a command of the broadest scope that explicit language, read in the context of sub-clause (2), will allow. "Freedom of speech and of the press guaranteed by the Constitution embraces at the least the liberty to discuss publicly and truthfully all matters of public concern without previous restraint or fear of subsequent punishment." The Act clearly and expressly infringes the freedom of speech by prohibiting the uttering of certain words. The preamble only supplies the reason or intention behind the prohibition. When an Act is impugned on the ground that it runs foul of the guarantee of free speech, the Court is only concerned with the question whether it does so or not; it is not concerned with the reason why it does so, (unless the case is sought to be brought within the prescribed limitations). The object behind the Act might have been to facilitate the collection of certain dues by prohibiting the incitement of illegal refusal to pay them, but there is no difference between enacting a law to collect dues by limiting the freedom of speech and enacting a law to restrict a speech so that Government dues may be collected. A legislature cannot enact a law infringing the freedom of speech, whether the infringement is its primary object or is a subsidiary object or is an unintended effect. No matter in what enactment, and for what purpose, the restriction on the freedom of speech is imposed, it is barred unless covered by sub-clause (2). There can be no more direct infringement of the right of free speech than the prosecution for the making of a certain speech. The enactment of the Act is as direct an infringement of the constitutional guarantee of free speech as is possible. There is absolutely nothing in the decision of the case of 'A.K. Gopalan',, that would suggest that the impugned Act does not contravene Article 19(1) (a). The Preventive Detention Act, 1950, does not contravene that provision, but it does not follow that the Special Powers Act also does not. There are important distinctions between the two Acts, one is preventive and does not directly refer to speech or expression, whereas the other is punitive and directly prohibits on pain of penalty the making of certain speeches. Undoubtedly the word "act" in S.3, Preventive Detention Act, includes making a speech, and since it makes a person liable to be detained so that he might not make a prejudicial speech, it can be argued that it infringes the guarantee of free speech. Preventive detention for reasons connected with the security of the State or the maintenance of public order is permissible, vide 7th Schedule, List III, Entry 3. If a Preventive Detention Act directly infrings the guarantee of free speech, but was enacted for either of the above objects, it would be saved by clause (2) of Article 19. A.K. Gopalan, therefore, could not, and did not, challenge the validity of Preventive Detention Act on the ground that it directly infringed his freedom of speech by detaining him so that he could not speak in a certain manner. The Supreme Court upheld it but not on the ground that taking action (such as of detention) against a person in order to prevent him from making a certain speech does not directly infringes his right of free speech. Moreover, punishing a person for making a speech may not be same as taking action in order to prevent his doing so; the Supreme Court did not express any opinion on this matter and I would not hazard any. The decision in 'A.K. Gopalan's case ' is, therefore, no authority for saying that S.3, Special Powers Act, is not inconsistent with Article 19(1)(a). The reasons for which the Preventive Detention Act was upheld do not apply in the present case. I have already pointed out that the contention of A.K. Gopalan was that he was deprived of his freedom of speech not by any provision of the Preventive Detention Act, but by being detained in exercise of the powers conferred by it. The reply was that if the detention resulted in his being deprived of the freedom of speech, it was an indirect or incidental effect; the Preventive Detention Act by itself did not cause that deprivation of the freedoms guaranteed by Article 19(1) (a). If any deprivation of the freedoms flows from the detention, the Constitution itself permits it through Sch.7, List III, Entry 3, and none can make a complaint about it. The applicant's complaint on the other hand, is that the Act itself prohibits his making certain speeches. He complains about his arrest because of its being the result of the operation of the impugned Act and not because of any consequences arising out of the arrest. In 'A.K. Gopalan's case ' the detention was the cause and the deprivation of the freedom the result and cause of grievance. In the instant case, the impugned Act is the cause of the deprivation of the freedom and grievance of the applicant and the arrest is merely the effect, and, for the purposes of the application, of no consequence at all. I repeat that the impugned Act could have been challenged even if the punishment provided under Section 3 were mere admonition and the offender were not liable to be arrested. This disposes of the second question. 14. The learned Advocate General contended that the impugned Act imposes the restrictions on the exercise of the right of free speech in the interests of the security of the State as well as of public order. I did not understand him to argue that it is a law in relation to incitement to an offence. Undoubtedly he vehemently argued that the freedom of speech does not permit an incitement to break a law. This argument must be rejected. Article 19(2) does not in so many words save a law in relation to incitement to break a law. "Incitement to break a law" is not same as "incitement to an offence", because every breach of a law does not amount to an offence. I have shown that non-payment of the irrigation dues is not an offence under the Northern India Canal and Drainage Act; I doubt if it is even a breach of any provision in the Act. That Act imposes only a cvil liability and provides the means for getting the liability discharged. If a cultivator does not pay the irrigation dues, he commits no greater breach of law than is committed by a person who does not fulfil a contract made by him. "The differentiation is also noticeable in Entry 3 of List III (Concurrent List) of the Seventh Schedule, which refers to the 'security of a State' and "maintenance of public order" as distinct subjects of legislation. The Constitution thus requires a line to be drawn in the field of public order or tranquillity marking off, may be, roughly, the boundary between those serious and aggravated forms of public disorder which are calculated to endanger the security of the State and the relatively minor breaches of the peace of a purely local significance, treating for this purpose differences in degree as if they were differences in kind." This means that the security of the State is endangered only by a serious and aggravated form of public disorder as distinguished from minor breaches of the peace which endanger only public order. Incitement to non-payment of irrigation dues is not such a serious and aggravated form of public disorder as is likely to endanger the security of the State. 16. "Public order" is not defined anywhere. Chapter VIII of the Indian Penal Code bears the heading "Offences Against The Public Tranquillity" and contains Sections 141 to 160 which punish offences of unlawful assembly and affray. Stephen divides all offences against public tranquillity of the State under two heads, one of those offences in which a normal tranquillity of a civilized society is disturbed either by actual force or at least by the show and threat of it and the other of those in which no actual force is either employed or displayed but in which steps are taken tending to cause it; see History of the Criminal Law of England by Stephen, Vol. II, page 243. Under the first head come the offences of treason, unlawful assemblies, levying of war and rebellions and under the second head come formation of secret societies, seditious conspiracies and libel. In his Commentaries on the Laws of England, 21st Edn. 4th Volume, he includes in crimes against public order the offences of treason, official secrets, counterfeit coins, unlawful meetings, affray, forcible criminal trespass, sedition and defamation. See also Stephen's Digest of the Criminal Law, Part II, dealing with offences against public order; in that part are included offences of treason, mutiny, disclosure of official secrets, unlawful assembly, affray, conspiracy and libel. If any inference is to be drawn from this inclusion of certain offences in the class of offences against public order, it is that the non-payment of Government dues and its incitement are not offences against public order and that a prohibition of the incitement to the non-payment has nothing to do with the maintenance of public order. List II of the Seventh Schedule of the constitution includes "public order" in entry 1 and prevention of animal diseases and cattle trespass, irrigation and canals, protection of wild animals and birds, weights and measures, inns, theatres, betting and gambling, land revenue, taxes, affray and duty etc. in other entries. If public order covered every offence, there was no necessity of making separate provisions for many of the matters mentioned above. If the collection of land revenue, taxes and irrigation dues had any direct connection with the maintenance of public order, no separate provision would have been made for land revenue, etc. "the expression 'for reasons connected with' must mean a real and genuine connection and not the fanciful, or highly problematic, connection between the maintenance of public order on the one hand and the subject of legislation, viz., black-marketing........."
The connection contemplated must, in our view, be real and proximate, not far-fetched or problematical." Under the Bihar Maintenance of Public Order Act, (5 of 1947) a person can be detained with a view to preventing him from acting in any manner prejudicial to the maintenance of the public order. In - 'Lalu Gope v. The King', AIR 1949 Pat 299, it was decided that committing thefts in running goods trains was not acting prejudicially to the maintenance of public order. The words 'for reasons connected with the maintenance of public order" in List II of the Seventh Schedule of the Government of India Act, 1935, entry I, were considered by the Federal Court in - 'Machindar Shivaji v. The King', AIR 1950 FC 129, where the question was about the validity of the C.P. and Berar Safety Act of 1948 made on the authority of that entry. Patanjali Sastry, J. observed that the question before them was whether the Act was made "with a view to prevent only such act or acts as are likely to endanger the public peace." Thus impliedly he interpreted "maintenance public order" as maintenance of public peace. An offence or a breach of law which has no effect at all on the public peace or tranquillity cannot be taken to be an offence endangering public order. A law punishing such an offence cannot be taken to be a law in the interests of maintenance of public order. "Now 'public order' is an expression of wide connotation and signifies that state of tranquillity which prevails among the members of a political society as a result of the internal regulations enforced by the Government which they have established." Sri S.C. Khare referred us to - 'Brij Bhusan v. State of Delhi', AIR 1950 SC 129, but we find that it is of no assistance to us. It was held in that case that a provision in an enactment requiring pre-censorship was not within the provision of the unamended Clause (2) of Article 19 which did not use the words "maintenance of public order." 17. The words "in the interests of public order" mean "for maintenance of public order". The interests of public order lie only if it is maintained. A restriction can be imposed in the interest of public order, if in the event of its not being imposed disturbance of public order is apprehended. It is not necessary that the apprehension be immediate or present or that the disturbance of public order be substantial. Whatever be the nature of gravity of the disturbance of public order, if there is an apprehension of it, a restriction can be imposed in order to remove the apprehension. All that is required is that the State must apprehend disturbance if no restriction is imposed. The precise question before us is whether the State feared that public order might be disturbed, if the right of a person to instigate a class of persons not to pay the dues recoverable by the State as arrears of land revenue were not restricted. There might have been in 1932 an apprehension of a serious disturbance of public order it the right of free speech were not restricted; but it does not necessarily follow that the fear existed in January 1950 and the necessity for imposition of the restriction continued. There was no constitutional guarantee in 1932 as it exists now and the validity of the Act could not have been challenged prior to 1932 on the ground on which it is challenged before us. By virtue of Article 13, as soon as the Constitution was enforced, the question arose whether the Act continued to be in force or had become void. The Act will be held to be continuing in force after the Constitution only if the restriction imposed by section 3 of it was at that time in the interests of public order. The bare fact that it was in the interests of public order in 1932 would not suffice to keep it alive after the Constitution. Therefore, in January 1950 it must have been apprehended by the State that public order would be disturbed if the right to instigate the non-payment of certain dues were not restricted, before it could be held to remain in force. If it was not in the interests of public order to impose any restriction then, the Act automatically became void and could not be revived subsequently on the recurrence of the apprehension. It will be irrelevant, therefore, to consider the conditions prevailing in 1954 and the fact that a political party has embarked upon an agitation against the payment of certain Government dues. We know that conditions were peaceful in January 1950 and there was no apprehension of disturbance of public order if the right to instigate the non-payment of certain Government dues was not restricted. The Act was not in force in the Farrukhabad district in January 1950; it was enforced in that district in 1954. Still it was a law in force within the meaning of Article 13; see the definition in sub-clause (3)(b). In considering Article 13, the Court is merely concerned with the provision that is impugned, and not with the question in what areas it was in force. Even if it was not enforced in any area, it could become void. If Section 3 was not enforced anywhere in January 1950, it only shows that there was no necessity for it, i.e., that restricting the right to instigate the non-payment was not in the interests of public order then. "Activities such as these are so remote in the chain of relation to the maintenance of public order that preventive detention on account of them cannot, in our opinion, fall within the purview of Entry I of List II of the Government of India Act, 1935." The act apprehended must be connected with public order in such a manner that if it is allowed to be done public order might be disturbed; unless there is such a connection, the restriction on the apprehended act cannot be said to be in the interests of public order. The learned Advocate General contended that the words "in the interests of" are more comprehensive than the words "for reasons connected with", and that the decisions interpreting the words "for reasons connected with public order" cannot aid us in interpreting the words "in the interests of public order". I do not think that the latter words convey an idea materially different from the former words. No interest can exist without some connection and it seems to me that if a restriction cannot be said to be for reasons connected with the maintenance of public order, it cannot also be said to be in the interests of public order. The Constitution never contemplated that a freedom granted by it could be infringed on the ground of a remote or problematical contingency; otherwise all freedoms could be liable to be infringed on one excuse or another and the granting of them would be in name only. "There is no room under our Constitution for a more restrictive view. For the alternative would lead to standardization of ideas either by legislatures, Courts, or dominant political or community groups." "a working principle that the substantive evil must be extremely serious and the degree of imminence extremely high before utterance can be punished." "was manifestly intended, as shown by the context, to apply only in cases of this class, and has no application to those like the present, where the legislative body itself has previously determined the danger of a substantive evil arising from utterances of a specified character." "The Courts should be astute to examine the effect of the challenged legislation. Mere legislative preferences or beliefs respecting matters of public convenience may well support regulation directed at other personal activities, but be insufficient to justify such as diminishes the exercise of rights so vital to the maintenance of democratic institutions. And so, as cases arise, the delicate and difficult task falls upon the courts to weigh the circumstances and to appraise the substantiality of the reasons advanced in support of the regulation of the free enjoyment of the rights." "Every one in the land should be free to think his own thoughts to have his own opinions, and to give voice to them, in public or in private, so long as he does not speak ill of his neighbour; and free also to criticise the Government or any party or group of people, so long as he does not incite anyone to violence." "yet to assimilate agitation, legitimate as such, with direct incitement to violent resistance, is to disregard the tolerance of all methods of political agitation which in normal times is a safeguard of free government. The distinction is not a scholastic subterfuge, but a hard bought acquisition in the fight for freedom." (Per Judge Hand in - 'Masses Pub. Co. v. Patten', (1917) 244 Fed 535 at p.540, quoted in Selected Essays on Constitutional Law, Vol. 2, page 1050). Section 3 of the Act does not punish incitement to violence or to resistance by force the recovery of government dues; it punishes incitement to non-payment of Government dues, in other words, political agitation against certain Government dues. The applicant told us that when he advocated non-payment of irrigation dues he did not expect any substantial response from the cultivators and that he still advocated the non-payment in order to exert pressure upon Government and to make them change their policy. "It is only through free debate and free exchange of ideas that government remains responsive to the will of the people and peaceful change is effected.......... Accordingly a function of free speech under our system of government is to invite dispute. It may indeed best serve its high purpose when it induces a condition of unrest, creates dissatisfaction with conditions as they are, even stirs people to anger." (Per Douglas, J. in 'Terminiello v. Chicago, at p.1134 of Law Ed.). Holmes and Brandeis JJ. thought that the greater danger to a democracy lies in the suppression of public discussion and that ideas and doctrines thought harmful or dangerous are best fought with words; see 'American Communications Asso. v. Douds, at p.395. Finally, I find that maintenance of public order or preservation of public peace was not at all the object for the enactment of the Act. It itself does not purport to have been enacted in the interests of public order; its avowed object was to deal with agitation against payment of certain liabilities. 20. In conclusion I find it difficult to accept the learned Advocate General's Contention that Section 3 of the Act, imposes restriction on the right of free speech in the interests of public order. Disturbance of public order is not a natural and probable consequence of the instigation to non-payment of dues realisable as arrears of land revenue. 21. The question whether a restriction on the right guaranteed by Article 19(1)(a) is reasonable or not cannot arise when the restriction is not found to be in the interests of public order, etc., or in relation to libel, etc. The restriction under consideration is a prohibition of instigating a class of persons not to pay certain dues realisable as arrears of land revenue. Though it is stated in the preamble of the Act that it was enacted to deal with illegal refusal to pay certain dues, the restriction is on instigation of non-payment of all sums recoverable as land revenue regardless of whether they are legally due or not. A sum may be recoverable as arrears of land revenue even though it is not legally due. Therefore, it cannot be contended that the words "recoverable as arrears of land revenue" mean legally recoverable as such. It may appear unreasonable to prohibit instigation of non-payment of sums which are illegally demanded from a class of persons. But, if the prohibition is found to be in the interests of public order, it justifies itself. If it is not found to be in the interests of public order, it would fall on that ground alone. No other flaw is discernible in the restriction. Other objections to the restriction are really on the ground of its being not in the interests of public order and have already been dealt with. A restriction must not be arbitrary or excessive; see 'Chintaman Rao v. State of Madhya Pradesh, If an utterance is likely to disturb the public order, the ordinary remedy is to prohibit it and the prohibition cannot be said to be arbitrary or of an excessive nature. The Act is of a permanent nature, though it might have been enacted to meet a certain emergency. It might not have been in force in every district of the State at the time of its enactment, but it has been in force in a number of districts now. However, these matters have absolutely no relevancy to the question whether the restriction is reasonable or not. 22. I have come to the conclusion that on 26-1-1950 the impugned provision was not in the interest of public order. If it was, nothing has happened since then to make it not in the interest of public order in 1954. 23. I have treated irrigation dues as dues recoverable as arrears of land revenue. They may also be treated as rates due to Government, but it will make no difference to what I have stated above. 24. The application should be allowed. M. L. Chaturvedi, J. :- This is a petition for the issue of a writ of 'habeas corpus' filed under Article 226 of the constitution. 26. The petitioner, Dr. Ram Manohar Lohia, is the General Secretary of the Praia Socialist Party of India. The Party is, at the present time, advocating the non-payment of irrigation dues which were enhanced a year or two ago under the orders of the Government of the State of Uttar Pradesh. The agitation is against the payment of the enhanced dues only. On 4-7-1954, the petitioner addressed one meeting at Kaimganj in the district of Farrukhabad at 4 p.m., and another at Farrukhabad at 8-30 p.m. In both these meetings, he severely criticised the enhancement of the irrigation dues and also exhorted the audience not to pay the enhanced dues. The Station Officer, Kaimganj, decided to prosecute the petitioner under Section 3, U.P. Special Powers Act, 1932, and he sent a 'chit' to the Station Officer, in charge police station Kotwali, Farrukhabad, asking the latter to arrest the petitioner for having committed offences under the said section. The Station Officer of Kotwali, Farrukhabad, also decided to prosecute the petitioner under the same section, and the petitioner was arrested at Railway Road, in Farrukhabad, at the house of one Lalla Babu, where the petitioner had been invited to dine. The arrest was made by the Station Officer of Kotwali, Farrukhabad, and he told the petitioner that he was being arrested under Section 3, U.P. Special Powers Act, which will hereafter be called as the impugned section. Immediately after the arrest of the petitioner, the City Magistrate of Farrukhabad, Sri A.H. Drummond, accompanied by the Sub-Divisional Magistrate and the Station Officer, Kaimganj, arrived at the place where the petitioner was arrested. The Station Officer of Kotwali, Farrukhabad, in his affidavit, states that he produced the petitioner before the City Magistrate as soon as he arrived on the spot, and the City Magistrate granted a remand of two days. The petitioner was then taken to the district jail of Farrukhabad and lodged there. It is then stated that two cases for making two speeches are pending before Sri P.R. Gupta, Judicial Officer, Fatehgarh, and they were taken up in the Central Jail, Fatehgarh, by the said Officer on 6-7-1954, the petitioner having, in the meantime, been transferred to the Central Jail from the District Jail. The petitioner then applied for time to move the High Court at Allahabad for the transfer of the cases, and the cases were adjourned to 19-7-1954. The present petition was made in this Court on 9-7-1954. 27. The contention of the learned counsel for the petitioner is that Section 3 of the impugned Act is inconsistent with the provisions of Article 19 (1) (a) of the Constitution and has, therefore, become void since the date of the coming into force of the Constitution. The argument of the learned counsel is that Section 3 of the impugned Act directly interferes with the freedom of speech guaranteed to the petitioner under Article 19 (1) (a) of the Constitution, and the restrictions placed by Section 3 of the impugned Act on this freedom are not justified by the provisions of Article 19 (2) of the Constitution, inasmuch as the actions made punishable by the section do not interfere with public order or the security of the State, nor do they amount to an incitement to commit any offence. It is further urged that, in any case, the restrictions placed by the section are unreasonable. Section 3 of the impugned Act is not thus saved by the provisions of Clause (2) of Article 19 of the Constitution. Another point was also urged at the time of the arguments, though it was not taken in the petition, and that point was that the petitioner's detention was illegal under Article 22, as he was not produced before any Magistrate within a period of 24 hours of his arrest. The learned Advocate General of U.P., who appeared for the State Government, controverted the above points raised by the petitioner's counsel, and further urged that this case was fully covered by the decision of their Lordships of the Supreme Court in the case of AIR 1950 SC 27. 28. These are the points that arise for consideration in this petition, but before proceeding to deal with them, a short history of the Act and the relevant provisions contained in S.3, may be mentioned. The Act was passed in 1932 during the period of the British regime when the noncooperation movement was in progress. Initially the Act was to remain in force for one year, but its life was extended from time to time till in the year 1940 the U.P. Legislature deleted sub-section (3) of Section 1 of the Act, which limited the duration of the Act, with the result that the Act became a permanent enactment as a result of the deletion of the said sub-section. This was done by Section 2 of U.P. Act 12 of 1940. Only Sections 1 and 2 of the Act were to remain in force all the time, but the remaining sections were to come into force only when the State Government, by notifications in the official Gazette, extended all or any of the remaining provisions to any district or to any part of a district in the Uttar Pradesh. "land revenue or any sum recoverable as arrears of land revenue or any tax, rate, cess or other due or amount payable to Government or to any local authority, or rent of agricultural land or anything recoverable as arrears of or along with such rent." The other important section is S.3, the validity of which is to be determined in this case. It may be quoted in full. "3. 'Punishment for instigation to the non-payment of a liability': Whoever, by words either spoken or written, or by signs or by visible representations, or otherwise, instigates, expressly or by implication, any person or class of persons not to pay or to defer payment of any liability, and whoever does any act, with intent or knowing it to be likely that any words, signs or visible representations containing such instigation shall thereby be communicated directly or indirectly to any person or class of persons, in any manner whatsoever, shall be punishable with imprisonment which may extend to six months, or with fine, extending to Rs.250/-, or with both". 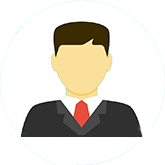 Section 4 of the Act permits a person to whom an arrear of liability is due to apply in writing to the Collector to realise it, and the Collector is bound to realise it if he was satisfied that the amount was due. The realisation is to be made as an arrear of land revenue in accordance with the law applicable to the recovery of such arrears. Section 6 provides for punishment for participation in a mock funeral ceremony, and Section 7 gives certain powers to control suspected persons; but we have nothing to do with either Section 6 or Section 7 or the following sections, excepting S.11, which makes offences under this Act cognizable offences. 29. Rates for supplying water are determined under the rules framed under the provisions of Part V of the Northern India Canal and Drainage Act, 8 of 1873, and Section 45 of this Act provides that any sum, lawfully due under this Part and certified by the Divisional Canal Officer to be so due, shall be recovered by the Collector from the person liable for the same, as if it were an arrear of land revenue. It is not necessary to refer to any other provision of this Act, because no question has been raised as to the legality or the fixation of the actual rates or their enhancement. 30. I propose first to consider the point raised by the learned Advocate General, which is to the effect that this case is covered by the decision in 'Gopalan's case, already mentioned. The learned Advocate General's argument is that the decision in 'Gopalan's case, is that if a person is deprived of his liberty by being confined to jail under some provision of law, then the validity of that provision is not to be considered with reference to the provisions of Article 19 of the Constitution at all, and the only relevant provisions in such cases are those mentioned in Articles 20, 21 and 22 of the Constitution. He says that when a citizen is confined to jail under a statute, it necessarily follows that he loses the rights guaranteed to him under Article 19. I am not prepared to accept the broad proposition advocated by the learned Advocate General. 31. As I understand the decision in 'Gopalan's case, it is to the effect that the validity of an enactment is to be judged with respect to the provisions of Article 19, if the legislation directly attempts to control a citizen's freedom of speech. But if the freedoms, enumerated in Article 19, are restricted indirectly as a result of the operation of legislation, authorising punitive or preventive detention, then the validity of the legislation is not to be judged with reference to Article 19 but with reference to the Articles dealing with the subject of detention. If the legislation, permitting detention, is in conformity with Articles20 to 22, the mere fact, that it indirectly affects the freedoms under Article 19, will not make it a void legislation. So that the crucial point to be determined is what is the exact action which the impugned legislation hits at. If it is the curtailment of any of the freedoms guaranteed under Article 19, then it has to be judged with reference to the provisions of that Article, but, on the other hand, if those freedoms are affected as an indirect result of a legislation, authorising punitive or preventive detention, then the provisions of Article 19 are not to be taken into consideration. So that it is not every legislation, which permits punitive or preventive detention, which is immune from a consideration as to its validity by reference to the freedoms guaranteed under Article 19. What has to be seen in every case is the actual action which the statute prohibits. In my opinion the law, as laid down in 'Gopalan's case ' is not that if a legislation directly interferes with freedom of speech and is not saved by the provisions of clause (2) of Article 19, then it should be held to be invalid, if it merely provides for the imposition of a fine by way of punishment; but that it would be valid if it provides for imprisonment instead of fine. 32. In 'Gopalan's case ' their Lordships were considering the validity of certain provisions of the Preventive Detention Act, 4 of 1950. Section 3 of that Act provides that the Central or the State Government may make an order directing the detention of a person, if satisfied that it was necessary to do so in order to prevent him from acting in any manner prejudicial to the defence of India, the relations of India with foreign powers, or the security of India, or the security of the State, or the maintenance of public order or the maintenance of supplies or services essential to the community. Their Lordships upheld the validity of this section, even though clause (2) of Article 19, as it then stood, did not permit the placing of restrictions on freedom of speech for purposes merely of the maintenance of 'public order'. Their Lordships held that the section did not directly purport to curtail the freedoms guaranteed under Article 19 of the Constitution, but was concerned with the subject of preventive detention, and it did not matter that as a result of detention the freedoms guaranteed under Article 19 were also interfered with. "Although personal liberty has a content sufficiently comprehensive to include the freedoms enumerated in Article 19(1), and its deprivation would result in the extinction of those freedoms, the Constitution has treated these civil liberties as distinct fundamental rights and made separate provisions in Article 19 and Articles21 and 22 as to the limitations and conditions subject to which alone they could be taken away or abridged." "So read, it clearly means that the legislation to be examined must be directly in respect of one of the rights mentioned in the sub-clauses (of Article 19). If there is a legislation directly attempting to control a citizen's freedom of speech or expression, or his right to assemble peaceably and without arms, etc. the question whether that legislation is saved by the relevant saving clause of Article 19 will arise. If, however, the legislation is not directly in respect of any of these subjects but as a result of the operation of other legislation, for instance, for punitive or preventive detention, his right under any of these sub-clauses is abridged, the question of the application of Article 19 does not arise. The true approach is only to consider the directness of the legislation and not what will be the result of the detention otherwise valid, on the mode of the detenu's life." The cases relied upon by the petitioner's counsel in that case were distinguished on the ground that the legislations held to be invalid were legislations which authorised the imposition of a ban on the circulation of a newspaper or precensorship on the publication of a journal. 34. A similar question of the invalidity of certain provisions of Abducted Persons (Recovery and Restoration) Act, 1949, came up for decision before a Full Bench of the East Punjab High Court in the case of - 'Ajaib Singh Lehna Singh v. State of Punjab', AIR 1952 Punj 309 (FB), and the learned Judges held that the relevant provisions of the said Act were valid as the freedoms guaranteed in sub-clauses (d), (e), (f) and (g) of clause (1) of Article 19 could be interfered with totally as the arrest and confinement were according to the procedure established by law, but they allowed the petition on a different ground. This case went up in appeal to the Supreme Court and their Lordships upheld the decision, - ('Vide State of Punjab v. Ajaib Singh', AIR 1953 SC 10 ), though they did not agree with the interpretation put by the Punjab High Court on Article 22 of the Constitution, with which we are not concerned in this case. While considering the point that the Act was inconsistent with the provisions of Article 19(1)(d) and (e) and Article 21, their Lordships of the Supreme Court held that the matter was concluded by the majority decision in 'Gopalan's case' and the High Court had correctly negatived the contention. 35. These were all cases where the main purpose of the impugned Acts was the detention of the petitioners, which incidentally deprived the petitioners of the freedoms enumerated in Article 19 also. 36. I now proceed to consider whether the actual act which the impugned section, namely, S.3, U.P. Special Powers Act, prohibits is the freedom of speech guaranteed under Article 19(1) (a) of the Constitution, or it is the stopping of every sort of instigation to the people not to pay the dues recoverable by the Government as arrears of land revenue. I have already quoted the provisions of the impugned section in full. What it actually prohibits is instigation to any person not to pay or to defer payment of any liability as defined in S.2. The prohibition extends to instigation, expressly or by implication, by words either spoken or written, or by signs or by visible representations or otherwise. It also makes punishable any act done with the intent or knowing it to be likely that any such instigation, referred to before, shall be communicated to any person or class of persons in any manner whatsoever. The punishment provided is an imprisonment up to six months or a fine of Rs.250/- or both. The clear object in framing the statute is that there should be no instigation by any means by any person to another not to pay the dues recoverable by the Government as arrears of land revenue. Not only written and spoken words have been made punishable but also signs and visible representations, and even other activities as also every act, which is likely to communicate the words, signs or visible representations to any other person. The object of the statute is to make instigations of every kind punishable, as the Government does not want interference in the recovery of its legal dues. The direct activity made punishable by this Act. in my opinion, is not the curtailment of any freedom of speech; and the validity of the Act, therefore, should not be judged with reference to Article 19 but with reference to the provisions of Article 22 of the Constitution. 37. The provisions of the Preventive Detention Act of 1950 hit at every sort of activities prejudicial to defence of India, security of India, security of the State, or the maintenance of public order, or the maintenance of supplies. The making of speeches is also an act, and though Section 3 does not specifically permit detention with a view to preventing a speech, yet there is no doubt that the making of a speech is also an activity, and the apprehension that a speech would be made justifies the order of detention. Indeed, it is generally the speeches, more than positive acts, which are apprehended to bring about the undesirable results, and numerous detentions have been made simply because it was apprehended that prejudicial speeches would be delivered. The only difference between S.3, Preventive Detention Act, and S.3, Special Powers Act, is that the impugned section clearly mentions the making of a speech, whereas S.3, Preventive Detention Act, includes it within the ambit of the expression "acting in any manner prejudicial to". I do not think the decision in 'Gopalan's case' would have been different if in Section 3(1)(a), Preventive Detention Act, the word "speaking" had also been added before or after the word "acting". The Preventive Detention Act is designed as much against improper speech as the impugned section and the mere omission of the word "speaking", in my opinion, does not materially alter the position. The subject of S.3, Preventive Detention Act, was preventive detention, whereas the subject of the impugned section is punitive detention, and what the impugned section makes punishable is all manner of instigation; and if the expression "word spoken or written" had not been used in this section, the making of a speech would still have been an instigation and punishable by the section. "(2) - Nothing in sub-clause (a) of clause (1) shall affect the operation of any existing law, or prevent the State from making any law, in so far as such law imposes reasonable restrictions on the exercise of the right conferred by the said sub-clause in the interests of the security of the State, friendly relations with foreign States, public order, decency or morality, or in relation to contempt of Court, defamation or incitement to an offence." The learned Advocate General justified the impugned section as imposing a reasonable restriction in the interest of security of the State and public order. So that the only points that arise for consideration on this question are (1) whether the impugned section imposes reasonable restrictions, (2) whether they are in the interest of the security of the state, and (3) whether they are in the interest of public order. The impugned legislation can only be upheld if the answer to the first point, as well as to one or both of the other two, is in favour of the respondent. I propose to deal with points (2) and (3) first. 40. The contention of the learned Advocate General was that this Act did not prohibit the making of speeches in general, or even a criticism of the taxes imposed by the Government or the laws promulgated by it. He said that the criticism could be as strong as the speaker liked and in any language he chose, and that it was permissible to preach that a particular piece of legislation or a particular tax was unjust and wholly improper. The impugned section does not prohibit any of these things, but what it does prohibit is the instigation to others not to pay their legal dues. He said that instigation like this is an instigation which has to be checked in the interest of the security of the State as well as of public order. His argument was that if taxes are not paid, the Government could not go on and there was bound to be a chaos in the State. Taxes form part "of the consolidated fund" of the State, and the security of the State depended on the maintenance of an adequate consolidated fund. So that it was in the interest of the security of the State itself that an instigation not to pay the just dues has to be stopped. I do not agree with the Advocate General on this point. There is a very limited number of taxes, the complete non-payment of which can result in undermining the financial security of a State. The number of taxes and of other Government dues is very large and it cannot be said that the non-payment of each one of these taxes or dues will result in financial unstability of the State. As argued by the petitioner, Dr. Ram Manohar Lohia, no movement of non-payment of taxes in general is ever likely to succeed, because the people, who pay most of those taxes, are not likely to be influenced by such a propaganda. An instigation not to pay a major tax or even the land revenue of the agricultural lands is also not likely to succeed to such an extent as to jeopardize the security of the State. As regards its financial condition instigations like these cannot be said to have as their natural consequence the effect of undermining the security of a State, nor can it be said to be its likely result. The possibility of the undermining of a State as a result of an instigation not to pay taxes is so remote that I do not think that the suppression of an acivity like this can be said to be in the interest of the security of the State. If clause (2) of Article 19 had not been amended, I do not think the impugned section could be said to be valid as a reasonable restriction to avoid undermining the security of the State. But the amended clause has now brought in the consideration of public order also and has justified the placing of restrictions on the freedom of speech in the interest of public order. I have come to the conclusion that the impugned section can be said to have been enacted "in the interest of" public order. 41. The learned counsel for the petitioner argued that the impugned section made a mere instigation punishable, even though there may be no question of the commission of any act of violence or of breach of peace. A simple exhortation to persons not to pay Government dues has been made punishable, though there may be no question on any breach of peace resulting from this instigation. His contention was that "public order" merely meant the absence of breach of peace or acts of violence. The learned Advocate General, however, contended that "public order" was not merely the absence of breach of peace and acts of violence, but had a positive aspect as well. According to him, "public order" signified ordered society based on proper regulation and attempting to undermine ordered society was disturbing "public order". The expression "public order" is of a wide import. But no definition of the word appears to have been attempted, though instances of what acts amount to disturbance of public order are to be found in a number of cases. The learned counsel for the petitioner drew our attention to same passages in the Stephen's Commentaries on the Laws of England, Vol. IV, page 126, Stephen's Digest of the Criminal Law, part II, and Blackstone's Commentaries, Vol. IV, Ch. XI, where offences against public order are mentioned; and he wanted to draw an inference that the expression "public order" was confined to acts which would amount to offences described as offences against public order in these different books. The inference drawn by the learned counsel however, does not appear to be justified, because these books were dealing with offences against public order and were not attempting to give any definition of the expression "public order" itself. They enumerated the acts, which were offences against public order, and dealt with those particular acts. The inference that everything, that fell outside the ambit of those acts, was not public order, does not appear to be justified. He also referred to the Defence of India Act, S.2, and to the Defence of India Rules, Rules 26 and 29, but here again no definition of the expression "public order" was meant to be given, and provision was sought to be made for certain activities which were considered to be prejudicial to the State. 42. I may now come to the cases cited by the learned counsel for the petitioner. The first case cited by him was the case of AIR 1949 All 513 (FB). In this case the validity of the U.P. Prevention of Black-Marketing (Temporary Powers) Act, 22 of 1949, was challenged, and the matter was referred to a Full Bench of this Court for decision. Section 3 of the above Act permitted the detention of a person up to a period of six months about whom the Provincial Government was satisfied that he habitually indulged in black-marketing. "Black-marketing" was defined to include disposing of or otherwise dealing in essential commodities with a view to making gain in a manner which may, directly or indirectly, defeat or tend to defeat the provisions of the U.P. Control of Supplies (Temporary Powers) Act of 1947, or the Essential Supplies (Temporary Powers) Act of 1946, or of any Order made under any of these two Acts. The Constitution had not come into force on the date of the decision of this case, and the attack on the legality of the legislation was based on the absence of the legislative competence of the State Government to pass such a legislation. The learned Judges held that the Provincial Legislature was competent to enact the laws dealing with preventive detention for reasons connected with the maintenance of public order, and also to enact the laws concerning production, supply and distribution of goods. But they held that this last power of enacting laws for production, supply and distribution of goods did not also imply a power to direct detention as a preventive measure. They then considered whether this preventive detention could be said to be connected with the maintenance of public order, and they came to the conclusion that it was not so connected. They accordingly held that the preventive detention of a person indulging in black-marketing was not within the competence of the State Legislature. Mr. Justice Waliullah was of the opinion that, even if there was some distant connection between black-marketing and public disorder, it could not be said that the detention was for reasons connected with the maintenance of public order. The expression "for reasons connected with", according to the learned Judge, meant "a real and genuine connection" between the maintenance of public order on the one hand and the subject of legislation, namely, black-marketing, on the other. Mr. Justice Wanchoo was also substantially of the same view, and he held, "The connection, to my mind, which is envisaged in item 1 of List II must be direct and clear as between cause and effect and not remote and doubtful like the one urged". "It is true that black-marketing in essential commodities may at times lead to a disturbance of public order, but so may, for example, the rash driving of an automobile or the sale of adulterated food-stuffs. Activities such as these are so remote in the chain of relation to the maintenance of public order that preventive detention on account of them cannot, in our opinion, fall within the purview of Entry 1 of List II". 43. The case of - 'Dilbagh Singh v. Emperor', AIR 1944 Lah 373 , does not appear to be very much in point, as the decision in that case was that the detention under Rule 129 of the Defence of India Rules, with the object that the police may have greater facilities for investigating into suspected offence, could not be said to be permissible under Rule 129 of the Defence of India Rules. 44. The case of AIR 1949 Pat 299, is an authority for the proposition that a habitual thief could not be detained under the Bihar Maintenance of Public Order Act, 1947, because it could not be said that his actions were prejudicial to public safety and maintenance of public order. Habitual commission of theft, according to the learned Judges, did not disturb public order. 45. In the case of - 'State v. Ahmed Ali', AIR 1951 All 459 , it has been held by a learned single Judge of this Court that the spread of disaffection against a party Government could not be said to be a ground for inferring that the public order would not be maintained. It is the right of every citizen in a democratic Government to spread disaffection against a particular party Government; but the disaffection should not be so spread as to result in violence or to resort to other illegitimate course. I respectfully agree with the decision in this case, but the point that arises in the present case is very much different from the point that arose in the reported case. "an expression of wide connotation signifying that state of tranquillity prevailing among the members of a political society as a result of the internal regulations enforced by the Government which they have instituted." The expression "public safety" has been defined as ordinarily meaning security of the public or their freedom from danger, but the meaning of the expression must vary according to the context. I am not concerned here with the meaning of the expression "public safety". "I think that "public order" may well be paraphrased in the context as public tranquillity and the words "public safety" and "public order" may be read as equivalent to security of the State and public tranquillity." Here their Lordships were discussing the meaning of the expression "public order" with reference to context as used in the Act impugned before them, namely, the East Punjab Public Safety Act of 1949. Applying the meaning of the expression "public order" as expressed in the case of 'Romesh Thappar, I think that an exhortation to the members of the public not to obey the laws in general or any particular law is likely to disturb the state of tranquillity prevailing among the members of the public, and the preaching of disobedience of a law or laws is meant to disturb that public tranquillity, of course, while referring to the law or laws, I mean those laws, which have been duly promulgated and are valid laws not inconsistent in any manner with the provisions of our Constitution. The criticism of a law or laws is one thing, because that may be with a view to have the laws changed and it is the very essence of democracy that every member of the public should have the right to propagate his views and to make all legitimate attempts to change a law or laws, which he considers improper or working a hardship on the public or any class of public. But exhortation to disobey duly promulgated and valid laws has a tendency of disturbing the state of tranquillity prevailing among the members of the public as a result of the regulations or laws enforced by the Government. The same is the position with respect to an exhortation not to pay taxes duly imposed or other legal dues recoverable by the State. That, to my mind, is the position keeping in view the meaning and significance of the expression "public order", as laid down in 'Romesh Thappar's case, and the provisions of the impugned section would be justified as having been enacted "in the interest of" public order. 48. In the present case, however, the position is still clear. What the impugned section makes punishable is an instigation not to pay the legal dues of the Government, which means the disobedience of the laws which have made those dues recoverable by the Government by the exercise of certain coercive process. This sort of instigation, in the circumstances at present prevailing in the country, is likely to lead even to breaches of peace and violence. The majority of persons to whom exhortation is made are likely to be uneducated people, who can easily be misled to take the law into their own hands and to resist the realisation of the legal dues by the public servants. This, in the ordinary course of things, is likely to lead to riots and breaches of public peace. An exhortation, therefore, in my opinion, to the members of the public to disobey the duly promulgated and valid laws, specially where those laws happen to authorise the public servants to realise the dues by coercive processes, is an act which can be classed as one subversive of public order. Laws relating to property, including money, which lay down the process by which the property is to be seized, or the money realised, are in the very nature of things likely to be looked upon as good or bad according to the angle of vision from which they are seen, and there has always been difference of opinion as regards the reasonableness or otherwise of such laws. An exhortation to the judgment-debtors in general to refuse to obey the decrees passed by the Courts would, to my mind, lead to public disorder, and the same is the position with respect to the recovery of legal dues by the officers of the Government. This has, in the past, led to riots and disturbances of public peace on a larger or small scale and, in my opinion, the natural result of such an exhortation is to disturb public tranquillity and help in creating riots. So applying even the narrower definition to the expression "public order", namely, the maintenance of public peace and tranquillity, I think that the making of an instigation in this respect penal is really in the interest of public order, and the legislation is justified under the amended provisions of Clause (2) of Article 19 of the Constitution. 49. I now propose to consider the question whether the restriction imposed on the freedom of speech on a citizen by the impugned section is a reasonable one or not. The learned counsel for the petitioner argued that the possibility of the commission of riots and breaches of peace, as a result of the instigation not to pay the enhanced irrigation rates, is a very remote possibility and not a natural consequence of the instigation. As I have already stated, I do not agree with this contention of the learned counsel. The public dues are recovered by the Officers of the Government by having recourse to coercive processes and, if the members of the public acting upon the instigation decide not to pay the dues, the occurrence of riots is the natural and likely consequence of the instigation. 50. The law in America as regards the freedom of speech, as also on many other points, is different from the law laid down by our Constitution. The First and the Fourteenth Amendments of the American Constitution do not impose any restrictions on the freedom of speech, and the Courts, therefore, had to make their own rules as regards the reasonableness or the existence of that freedom, and as regards the limitations which could be imposed by the State in the exercise of its police powers. In our Constitution, the position is very different. The freedoms, as enumerated in Article 19 (1), are made subject to the succeeding clauses of the same Article, and when judging the constitutionality of an Act the Courts in India have to judge those Acts according to the provisions of the Constitution itself. The observations made in some of these cases themselves do not really support the wide proposition urged by the learned counsel, namely, that the acts of disorder must be "immediate and necessary consequence" of the freedom sought to be curtailed. Whether the consequence of a particular act or speech is likely to disturb the public order is a matter which in the first instance, has to be left to the discretion of the Legislature, and there is a presumption that the restrictions imposed by the Legislature are reasonable ones because it is the members of the Legislature, who are the representatives of the people and who are expected to know better their reactions to particular actions or speeches. The issue of reasonableness is certainly justiciable and cases have happened in which Courts have held that the restrictions were not reasonable. But, as I have already said, there is a presumption in favour of the validity of a legislation on this point, and a restriction imposed by a legislation should be held by the Courts to be unreasonable only if, in spite of the presumption in favour of the legislation, the Court comes to the conclusion that the restriction contained in it is not a reasonable one. Even the cases cited by the learned counsel for the petitioner contain observations which support this view. In the first case referred to above, it has been held at p.1147. "The case is to be considered in the light of the principle that the State is primarily the judge of regulations required in the interest of public safety and welfare; and that its police statutes may only be declared unconstitutional where they are arbitrary or unreasonable attempts to exercise authority vested in the State in the public interest." "And the immediate danger is none the less real and substantial because the effect of a given utterance cannot be accurately foreseen. The State cannot reasonably be required to measure the danger from every such utterance in the nice balance of a jeweller's scale. A single revolutionary spark may kindle a fire that, smoldering for a time, may burst into a sweeping and destructive conflagration. It cannot be said that the State is acting arbitrarily or unreasonably when, in the exercise of its judgment as to the measures necessary to protect the public peace and safety, it seeks to extinguish the spark without waiting until it has enkindled the flame or blazed into the conflagration." I think it can safely be said that a State cannot reasonably be required to postpone the adoption of measures until the utterances or instigations have led to actual disturbance of the public peace. It would be acting wisely and properly if it adopts measures which suppress the threatened danger. The quotations made above refer to acts which tend to overthrow the Government itself, but I think the principles laid down there apply equally to the cases of maintenance of public order. Some of these cases have laid down that full opportunity must be given to the citizen for political discussion, and indeed such an opportunity is essential to the security of the State. No exception can be taken to this proposition, and the State cannot be permitted to stop political discussion; but a clear instigation to disobey the laws, which legalise the recovery of certain State dues, transgresses the limit of political discussion. 51. The learned Advocate-General drew our attention to the case of '(1949) 94 Law Ed 925 (N)'. In this case the Supreme Court has held that the rule of "clear and present danger" does not apply to every case, and it is the reason behind the rule that has to be seen while determining the constitutionality or otherwise of the statute than the rule itself. The American cases cited above are not very helpful, excepting that they illustrate the rule which is more or less universal that a person is held responsible for the natural consequences of his act and not those which may be far-fetched or too remote. 52. As provided by sub-section (2) of Section 1, S.3 and the following sections of the U.P. Special Powers Act only come into force when the State Government decides to apply those provisions to a particular area or areas. The impugned section, therefore, comes into force only when the State Government thinks that there is an emergency and the provisions really partake of the nature of an emergency legislation. The section appears to have remained inoperative from 1940 till the month of April 1954, when its provisions were made applicable to two of the districts in this State, but subsequently in June 1954 it was considered desirable to extend the provisions to 31 other districts. Of course, it has been left to the State Government to decide as to the existence of an emergency, and the delegation of this power on the State Government cannot be said to be unconstitutional or invalid. The position, therefore, is that the impugned section has been brought into force in the case of an emergency, and this is an additional reason for holding that the provisions of the statute do not create an unreasonable restriction on the freedom of speech. 53. In view of what I have stated above, I have come to the conclusion that the impugned section is a permissible piece of legislation and is protected by the provisions of Clause (2) of Article 19 of the Constitution. 54. There is one part of the section which, in my opinion, may not be protected by the provisions of Clause (2) of Article 19. The definition of the word "liability" as given in S.2, Special Powers Act, includes rent of agricultural land or anything recoverable as arrears of or along with such rent. Section 4 provides that any person to whom an arrear of liability is due may apply in writing to the Collector to realise it, and the Collector shall, after satisfying himself that the amount claimed is due, proceed to recover it as arrears of land revenue. Section 3 makes it punishable to instigate nonpayment of an amount like this as well. It is difficult to say that the State Government should first take upon itself to recover dues of a private individual and then make an instigation not to pay it penal, on the ground that this instigation is likely to lead to breaches of peace and disorder. I very much doubt whether this portion of the impugned section is a valid piece of legislation, but the question does not arise in this case and this part is severable from the rest of the section. It does not, therefore, affect the validity of the relevant portion of S.3. 55. I now come to the last point argued in the case namely that the detention of the petitioner was illegal inasmuch as the provisions of Clause (2) of Article 22 have not been followed, as the petitioner was not produced before a Magistrate within a period of 24 hours of his arrest. According to the facts stated in the counter affidavit, filed by the Station Officer, police station Kotwali, Farrukhabad, the petitioner was first arrested at the house of Lalla Babu, and the arrest was made by the Station Officer himself as the petitioner was supposed to be guilty of the commission of a cognizable offence. Soon after his arrest, however, within a few minutes, the City Magistrate of Farrukhabad also reached the spot along with the Sub-Divisional Magistrate of Kaimganj. The petitioner was then produced by the Station Officer, Kotwali, before the City Magistrate, who granted a remand for two days. The petitioner was then sent to the district jail, and on the 6th of July the Judicial Officer went to try him in the jail. There an application was made for the adjournment of the case, and the case was adjourned to the 19th of July. The argument of the learned counsel is that, in the circumstances of this case, it must be taken to be proved that the arrest itself was directed by the City Magistrate and, therefore the production of the petitioner before the City Magistrate was not such a production as would bring it within the meaning of the expression as used in Clause (2) of Article 22 of the Constitution. In support of this submission, the learned counsel cited a recent Division Bench decision of this Court in 'AIR 1954 All 601'. What happened in this case was that the petitioners were in effect arrested by the City Magistrate and they were taken into custody under his orders and under his direct supervision. The City Magistrate then remanded the petitioners into jail custody and the order of remand was signed by him without scrutinising as to the legality and propriety of the procedure adopted by him. On these facts it was held that there was no proper production of the petitioners before a competent Magistrate within 24 hours of their arrest, and consequently the further detention in jail was illegal and unconstitutional. This decision is binding upon us, and, assuming that it contains a correct exposition of law, I think the facts of the case before me are substantially different from the facts of the case before the Division Bench referred to above. In the instant case the facts appear to be that the petitioner was arrested without warrant by the Officer-in-charge Kotwali, and a few minutes after that the City Magistrate also reached the spot, and the Station Officer produced the petitioner before the City Magistrate who remanded the petitioner to custody. The essential difference between the two cases is that in the reported case it was the Magistrate who himself directed and supervised the arrest of the petitioners, whereas in the instant case the arrest was made by the Station Officer, authorised to arrest the petitioner, as being accused of a cognizable offence. He was then produced before the City Magistrate who granted a remand. The City Magistrate was not present at the time of the arrest and could not be said to have ordered or supervised the arrest. The decision in the Division Bench case, therefore, does not govern the instant case, and the facts proved in the case clearly show that the petitioner was produced before a Magistrate well within the time mentioned in Clause (2) of Article 22 of the Constitution. 56. After I had written my judgment, I had the benefit of reading the judgment of my learned brother Desai. Besides certain other matters, he has relied on one point which I consider it necessary to mention in my judgment as well. The view expressed by him is that the validity of the impugned section should be seen with reference to the date on which the Constitution came into force and according to him, on that date, in any case, it cannot be said that the impugned section was necessary in the interest of public order. I do not agree with this view and I am of the opinion that the impugned section was not inconsistent with Article 19 of the Constitution, even on 26-1-1950. Though the impugned section was on the statute book, the State Government had not extended its application to any place in the State of utter Pradesh. It was to come into operation only if circumstances arose, which induced the State Government to apply the provisions of section to any local area in the State of Uttar Pradesh. While judging its validity the circumstance can be taken into consideration that this provision has always been in the nature of an emergency provision. If as an emergency provision it is valid today, it should also be taken to be valid on 26-1-1950, though no such emergency may then have been in existence as it has arisen in the last few months in this State. So far, however, I agree with my brother that, if the impugned section is held to be inconsistent with Article 19 on the coming into force of the Constitution, then the legislation would continue to be void and must also be held to be void today. 57. In the first of the two points, that we have decided to refer to a third Judge for his opinion, the main question, to my mind, is whether the impugned section is to be judged with reference to Article 19(1)(a) of the Constitution or not, and whether that consideration is shut out by the decision of their Lordships of the Supreme Court in 'Gopalan's case'. 58. For the reasons that I have mentioned above, I am of the opinion that this petition should be dismissed. (1) Was the provision of S.3, U.P. Special Powers Act of 1932, making it penal for a person by spoken words to instigate a class of persons not to pay dues recoverable as arrears of land revenue, inconsistent with Article 19 (1) (a) of the Constitution on 26-1-1950? 1. Was the provision of Section 3 of the U.P. Special Powers Act of 1932, making it penal for a person by spoken words to instigate a class of persons not to pay dues recoverable as arrears of land revenue, inconsistent with Article 19(1) (a) of the Constitution on 26-1-1950? 2. If so, was it in the interests of public order? On account of this difference of opinion the case has come to me for my opinion on the points above referred to. "Section 3. 'Punishment for instigation to the non-payment of a liability'. Whoever, by words either spoken or written, or by signs or by visible representations, or otherwise, instigates, expressly or by implication, any person or class of persons not to pay or to defer payment of any liability, and whoever does any act, with intent or knowing it to be likely that any words, signs or visible representations containing such instigation shall thereby be communicated directly or indirectly to any person or class of persons, in any mariner whatsoever, shall be punishable with imprisonment which may extend to six months, or with fine, extending to Rs.250/-, or with both." "land revenue or any sum recoverable as arrears of land revenue or any tax, rates, cess or other due or amount payable to Government or to any local authority or rent of agricultural land or anything recoverable as arrears of or along with such rent." In short Section 3 makes it penal for a person to instigate another person or class of persons not to pay or defer payment of any amount payable to Government or local authority or the payment of agricultural rent to a Zemindar. It is important to remember that while instigation not to pay or defer payment of the above dues has been made an offence, the non-payment or deferring payment of such dues is not an offence at all. Thus though a person who does not make payment of a liability or defers payment thereof is not guilty of any offence, yet this Act makes a person who instigates another not to pay or defer payment of any liability guilty of a crime. 64. This Act was passed in 1932 during the British rule and was tamporary, but after the Congress Government had resigned in the Provinces and the Governor's autocratic rule was introduced under Section 93, Government of India Act, 1935, it was made permanent in 1940 and since then it has continued to exist on the Statute Book. On 26-1-1950, India became a Sovereign Republic under a new Constitution which guaranteed to the citizens of India several freedoms. One of such freedoms is the right to "freedom of speech and expression" (Art.19(1) (a)). This freedom means that every citizen of India has, subject to certain limitations, an absolute right to 'say' anything he likes, good, bad or indifferent, right or wrong, palatable or unpalatable to the Government. "If the history of civilization has any lesson to teach, it is this: there is one supreme condition of mental and moral progress which it is completely within the power of man himself to secure, and that is perfect liberty of thought and discussion. The establishment of this liberty may be considered the most valuable achievement of modern civilization, and as a condition of social progress it should be deemed fundamental. The considerations of permanent utility on which it rests must outweigh any calculations of present advantage which from time to time might be thought to demand its violation." 66. Any law curtailing this absolute freedom would be void, because every law which contravenes the rights guaranteed by the Constitution is void as declared by Article 13. But an absolute freedom to say anything one would like to say, may lead to evils which may not be in the interests of the State as a whole. The interests of the State are, therefore, secured as against the freedom of the individual by laying down the limitations under which the freedom may be exercised. These limitations are mentioned in Clause (2) of Article 19, and are in respect of seven matters. (g) incitement to an offence. In the present case we are mainly concerned with "public order". If there be any law placing reasonable restrictions on the otherwise absolute right of free speech and expression, in respect of or in the interest of the above seven subjects, then such law cannot be said to be void. 67. These restrictions being in the nature of (exceptions to the general rule of the absoluteness of freedom of speech and expression are to be directly construed. Moreover since the exceptions to the absolute freedom of speech and thought are specifically and expressly laid down in the Constitution, it is clear that there can be no other exceptions than those which are so specifically and expressly mentioned. If the liberty of a citizen is curtailed by any law then it must be shown that the law falls within the four corners of these exceptions and it must also be shown that the restrictions are reasonable. "The Article (19(1)(a)) has to be read without any preconceived notions. So read, it clearly means that the legislation to be examined must be directly in respect of one of the rights mentioned in the sub-clauses. If there is a legislation directly attempting to control a citizen's freedom of speech or expression or his right to assemble peaceably and without arms etc., the question whether that legislation is saved by the relevant saving clause of Article 19 will arise. If, however, the legislation is not directly in respect of any of these subjects but as a result of the operation of other legislation, for instance for punitive or preventive detention, his right under any of the sub-clauses of Article 19 is abridged, the question of the application of Article 19 does not arise. The true approach is only to consider the directness of the legislation and not what will be the result of the detention otherwise valid, on the mode of the detenu's life." "Where, as a penalty for committing a crime or otherwise, the citizen is lawfully deprived of his freedom, there could no longer be any question of his exercising or enforcing the rights referred to in Clause (1) (of Article 19). Deprivation of personal liberty in such a situation is not, in my opinion, within the purview of Article 19 at all but is dealt with by the succeeding Articles20 and 21. In other words, Article 19 guarantees to the citizens the enjoyment of certain civil liberties 'while they are free', while Articles20 to 22 secure to all persons-citizens and non-citizens-certain constitutional guarantees in regard to punishment and prevention of crime." It is not necessary to quote the observations of the other learned Judges. It will be noticed that the learned Judges of the Supreme Court were meeting the argument that was advanced on behalf of Gopalan that he was deprived of the liberty guaranteed to every citizen under Article 19 'as a result of the detention under the Preventive Detention Act. No question was raised in that case whether the Preventive Detention Act itself was void on the ground that it restrained the freedom of speech and expression or of other rights mentioned in Article 19 before a person was detained. If the same argument is advanced in connection with punitive detention, namely that punitive detention is bad because by reason of that detention a person is not free to exercise the rights conferred by Article 19, then also the argument will have to be rejected. I do not read the observations of the Supreme Court to mean that if the complaint is that a person is not free to exercise the rights guaranteed to him under Article 19 and a restraint is placed upon the exercise of those rights and because of the violation of those restraints he is detained punitively, then also Article 19(1) (a) will have no application to his case. A little reflection will show that such an argument would lead to a complete negation of the freedom guaranteed under Article 19. The easiest thing for the legislature to do would be to make a law making it an offence to exercise any of the rights mentioned in Article 19 and then to say, 'Because he is being detained for breach of the law so made, Article 19(1) (a) will have no application'. I do not think the learned Judges of the Supreme Court ever intended to lay down such a proposition. It was urged that this is exactly what they have said in the later case, AIR 1951 SC 270. I do not think that any such conclusion can be drawn from the observations made in that case. 69. Ram Singh was arrested by the order of the District Magistrate, Delhi, under Section 3, Preventive Detention Act, 1950, under an order reciting that he was to be detained "with a view to the maintenance of public order in Delhi." In the grounds of detention communicated to him, however, reference was made to certain speeches which were said to have been made by him or were likely to be made in future, speeches which were likely to excite disaffection between Hindus and Muslims, and thereby to affect the maintenance of public order in Delhi. "It follows that the petitioners now before us are governed by the decision in 'Gopalan's case, notwithstanding that the petitioner's right under Article 19(1) (a) is prejudiced 'as a result of his detention under the Act'." "It was decided by a majority of five to one (in Gopalan's case) that a law which authorises deprivation of personal liberty did not fall within the purview of Article 19 and its validity was not to be judged by the criteria indicated in that Article but depended on its compliance with the requirements of Articles21 and 22, and as Section 3 satisfied those requirements, it was constitutional." It was urged by the Advocate General on the basis of this observation in the judgment that wherever a person was deprived of his liberty by reason either of preventive detention or punitive detention, then in all those cases he cannot raise the plea that the Act under which he was detained contravened Article 19 of the Constitution. As I have already stated, this is not a conclusion that has to be drawn from what their Lordships observed in that case. They were all the time considering the question of abridgment or curtailment of the rights guaranteed under Article 19 'as a result of punitive or preventive detention'. They were not considering the question which falls for consideration in this case before us, that where an Act directly curtails the right of freedom of speech and as a result of the violation of the provisions of which a person is punitively detained, whether in such a case he can rely upon the rights to the freedoms guaranteed to him by Article 19. In my judgment, while Article 19(1) is not contravened when curtailment of the freedom mentioned therein is brought about 'as a result of detention preventive or punitive under laws otherwise valid, (and it may be further said that while in the case of preventive detention, Article 19 (1) is not contravened at all (as pointed out in - 'Brij Bhushan's case ) ), Article 19 (1) is contravened when punitive detention is effected 'as a result of the exercise of those freedoms. In the present case Dr. Lohia's complaint is not that Article 19(1) (a) has been contravened because he has been detained; his complaint is that the said Article is contravened because the impugned Act made it unlawful for him to exercise the freedom of speech and expression guaranteed to him. 70. It was then urged that S.3, Special Powers Act, does not directly deal with the subject of freedom of speech and expression but that it deals with a certain kind of instigation, namely instigation to refuse to pay or defer payment of a liability of the kind mentioned in Section 2 of the Act. It was urged that the fact that the instigation was to be done by means of speech or other kind of expression was merely incidental and the main object of the Act was to prevent an 'act' of instigation and that just as under the Preventive Detention Act, which was held valid by the Supreme Court, a person could be detained if he was considered to be likely to do an act which threatened the security of the State or public order, so also Section 3 of the impugned Act must be considered to be valid. In my judgment this is not a correct reading of the effect of S.3, Special Powers Act. There can be no doubt to my mind that the direct attack in S.3, Special Powers Act, is on the right of freedom of speech and expression. 'To instigate' means to goad or urge forward; to set on; to provoke; to incite. How are all these actions to be done except by means of speech or some other mode of expression? No other mode has been suggested to me on behalf of the State. The object of the legislation is, therefore, clearly one to restrain a particular kind of speech or expression, namely a speech or expression which incites or provokes or urges a person, or class of persons, to do a certain thing or not to do a certain thing mentioned in the section. I think, therefore, that Section 3 of the impugned Act is a legislation directly dealing with the freedom of speech and expression and prejudicing the right guaranteed under the Constitution, and as such its validity must be considered with reference to Clause (2) of that Article. I would, therefore, answer the first question referred to me in the affirmative. 71. This leads me to consider whether the section in question is a restraint upon the right of speech and expression in the interests of 'public order'. Sub-clause (2) of Article 19 justifies reasonable restraint on the right of freedom of speech and expression on several grounds. Before my learned brothers before whom the case was argued in the first instance it was urged that the restraint imposed by S.3, Special Powers Act, was in the interests of the 'security of the State'. Both the learned Judges were of opinion that this contention was not sound. The argument was, however, repeated before me. From the form of the second question I take it that I was not called upon to answer this argument, but I allowed the learned Advocate General to deal with it and I have no hesitation in saying that I agree with the view of my learned brothers on this point. It is not necessary for me to elaborate the reasons for this view because they have already dealt with it in detail in their judgments. I would, therefore, proceed to consider whether the impugned section imposes a restriction on the right of freedom of speech and expression guaranteed under Article 19 (1) (a) in the 'interest of public order'. "Now, 'public order' is an expression of wide connotation and signifies that state of tranquillity prevailing among the members of a political society as a result of the internal regulations enforced by the Government which they have instituted." The learned Judge was dealing with the question whether 'public safety and 'public order' were comprised' within the expression 'security of the State'. It may be recalled that clause (2) of Article 19, before its amendment by the Constitution First Amendment Act, 1951, did not protect restraints on the rights conferred under Article 19(1) (a) on the ground that they were in the interests of 'public order' though the restraints could be imposed on the ground that the 'security of the State' was threatened. His Lordship differentiated 'security of the State' from 'public order' and held that 'security of the State' referred to serious threats to public peace and tranquillity, while 'public order' under the various clauses of Article 19 referred to 'less serious threats to public peace and tranquillity'. "The Constitution thus requires a line to be drawn in the field of public order or tranquillity marking off, more or less roughly, the boundary between those serious and aggravated forms of public disorder which are calculated to endanger the security of the State and the relatively minor breaches of the peace of purely local significance, treating for this purpose differences in degree as if they were differences in kind." There can be little doubt that 'public order' was taken by his Lordship in - 'Romesh Thappar's case' as something intimately connected with peace and tranquillity. It was urged by the learned Advocate General that in the definition of public order, the words "as a result of the internal regulations enforced by the Government which they have instituted" every kind of regulation was intended to be included. It was urged that 'public order' need not necessarily connote a state of peace and tranquillity but that it also embraces within its scope a state of society in which the laws in force are observed. I do not think that this was what was intended to be conveyed when the expression 'internal regulations' was used. From the observations made in the case it must be held that by 'internal regulations' was meant internal regulations relating to peace and tranquillity. The use of the expression 'public order' in legislative enactments and by learned writers on the subject, clearly shows that the expression is used in connection with a 'state of peace and tranquillity' and that a law 'in the interests of public order' has reference to a violent disturbance of public peace and tranquillity. In the Penal Code, for instance, Chap. VIII deals with 'offences against public tranquillity' and defines the offences of 'unlawful assembly', 'rioting', 'promoting enmity between classes' and 'affray'. All these are offences which disturb or tend to disturb public peace and tranquillity. In Stephen's History of Criminal Law of England, Vol. 2, the learned author divides all activity against public tranquillity under two heads: one consisting of offences in which tranquillity of a civilised society is disturbed by actual force or at least by the show and threat of it, and the other in which no actual force is either employed or displayed but in which steps are taken tending to cause it. In his Commentaries on the Laws of England, 21st Edn., Vol.4, the learned author includes in crimes against 'public order' the offences of treason, official secrets, counterfeit coins, unlawful meetings, affray, forcible criminal trespass, sedition and defamation. "Judge Hand places outside the limits of free speech one who counsels or advises otherwise to violate existing laws. It is true, he says, that any discussion designed to show that existing laws are mistaken in means or unjust in policy may result in their violation, but if one stops short of urging upon others that it is their duty or their interest to resist the law, he should not be held to have attempted to cause illegal conduct." The case in which these observations were made has not been placed before me and I am unable, therefore, to say in what circumstances the learned Judge was led to make these observations. I cannot, however, imagine that incitement to the breach of every kind of law whether it involved violence or threat to public peace or not was intended by the learned Judge when he spoke of violation of existing laws. 74. It was said that in order that a democracy should run successfully it is essential that its citizens should obey the laws duly promulgated by the State. I agree that the observance of the rules of law by all is one of the basic conditions of the successful working of a democracy. The Rule of Law in which the law is obeyed not only by the officers and servants of the State but by all its citizens is a sine-qua-non of all democracies as indeed of all civilized societies. No responsible person or party in a democracy would wantonly incite the people to disobedience of laws duly promulgated. But occasions may be imagined when thoroughly honest men of the highest integrity may consider it their conscientious duty to advise people to disobey an unjust law non-violently and to discbey it themselves. "Men of Athens, I honour and love you; but I shall obey God rather than you, and while I have life and strength I shall never cease from the practice and teaching of philosophy, exhorting anyone whom I meet". For know that this is the command of God; and I believe that no greater good has ever happened in the State than my service to God ".. If you think that by killing men you can prevent someone from censuring your evil lives, you are mistaken .... That is not a way of escape which is either possible or honourable; the easiest and the noblest way is not to be disabling others, but to be improving yourselves." "Law never made men a whit more just; and by means of their respect for it, even the well disposed are daily made the agents of injustice. A common and natural result of an undue respect for law is that you may see a file of soldiers, Colonel, Captain, Corporal pirates, powder-monkeys and all marching in admirable order over hill and dale to the wars, against their wills, nay, against their common sense and consciences, which makes it very steep marching indeed, and produces a palpitation of the heart." "That law-breaker breaks the law surreptitiously and tries to avoid the penalty; not so that civil resister. He ever obeys the laws of the State to which he belongs, not out of fear of the sanctions, but because he considers them to be good for the welfare of society. But there come occasions, generally rare when he considers certain laws to be so unjust as to render obedience to them a dishonour. He then openly and civilly breaks them and quietly surfers the penalty for their breach. And in order to register his protest against the action of the law-givers, it is open to him to withdraw his co-operation from the State by disobeying such other laws whose breach does not involve moral turpitude." 78. But though a man will be punished for his disobedience of the laws it is not necessary that the law should punish in every case those who incite such disobedience. The vital difference between actual disobedience and incitement to disobedience is that the latter is an exercise of the right of freedom of speech and expression which can be curtailed only if it falls within the ambit of Clause (2) of Article 19. 79. In my opinion our Constitution safeguards to every citizen of India the freedom to preach non-violent disobedience to civil laws, not being laws mentioned in Clause (2) of Article 19. 80. If the contention of the learned Advocate General that an incitement to breach of every kind of laws is likely to lead to a breach of public order were true, it would hardly have been necessary for the fathers of the Constitution to single out in Clause (2) of Article 19, laws relating to seven matters only including 'incitement of offences'. Indeed the reference to "incitement to an offence" clearly shows that an incitement to a breach of every civil law is not necessarily contemplated in Clause (2). "It is said that ideas are explosive and dangerous. To allow them such unfettered freedom is, in fact, to invite disorder. But, to this position, there are at least two final answers. It is impossible to draw a line round dangerous ideas, and any attempt at their definition involves monstrous folly. If views, moreover, which imply possible disorder are able to disturb the foundations of the State, there is something supremely wrong with the governance of that State. For disorder is not a habit of mankind. We cling so eagerly to accustomed ways that, as even Burke insisted, popular violence is always the outcome of a deep popular sense of wrong. The common man can only be persuaded to outbreak, granted his general habits, when the Government of the State has lost its hold upon his affection; and that loss is always the reflection of a profound moral cause......Almost always freedom of speech results in a mitigation which renders disorder unnecessary; almost always, also, prohibition of that freedom merely makes the agitation more dangerous because it drives it underground......No Government is entitled to assume that disorder is imminent: the proof must be offered to an independent authority. And the proof so offered must be evidence that the utterance to which it takes exception was, at the time and in the circumstances in which it was made, definitely calculated to result in a breach of the peace." The second proposition has been laid down by the Supreme Court in AIR 1950 FC 67 confirming a Full Bench decision of this Court AIR 1949 All 513 (FB). In that case the question was whether black-marketing in special commodities can be in respect of the maintenance of public order. The Supreme Court observed that "It is true that black-marketing in essential commodities may at times lead to a disturbance of public order, but so may, for example, the rash driving of an automobile or the sale of adulterated foodstuffs. Activities such as these are so remote in the chain of relation to the maintenance of public order that preventive detention on account of them cannot fall within the purview of legislative authority. The connection between the legislation and the object of the legislation must be real and proximate, not far-fetched or problematic." 82. Instances in which disobedience of laws was considered not to constitute a threat to public order are numerous. The instance of black marketing in essential commodities has already been quoted. In AIR 1949 Pat 299, it was held that the remaining at large of a habitual criminal convicted or suspected or committing thefts in running goods trains was not an act prejudicial to the maintenance of public order. In AIR 1944 Lah 373 , the activity of certain contractors in making large claims and receiving payment for work which they had never done and of cheating the Government on a large scale was held not to constitute a threat to public order. In (1939) 310 US 88 a statute forbidding loitering or picketing at the scene of a labour dispute was considered to be in violation of the freedom of speech and expression guaranteed by the Constitution. In - 'Sodhi Shamsher Singh v. State of Pepsu', AIR 1954 SC 276 a person was alleged to have published and distributed pamphlets which were couched in the most filthy and obscene language and amounted to a vitriolic attack upon the character and integrity of the Chief Justice of PEPSU who was accused of gross partiality and communal bias. It was held by the Supreme Court that the orders of detention should be held to be illegal and must be set aside as the publication or distribution of the pamphlets could not have any rational connection with the maintenance of law and order in the State or prevention of acts leading to disorder or disturbance of public tranquillity. It cannot, in my opinion, be laid down as a general proposition that an incitement to the breach of any kind of law would have a proximate and clear connection with the disturbance of public order. 83. We may now consider whether the incitement mentioned in S.3, Special Powers Act, has a clear and proximate connection with public order. Now, S.3 prohibits an incitement "not to pay, or to defer payment of, any liability". As mentioned already the incitement in the present case was with reference to the payment of the rates for the use of canal water. The non-payment of such rates which have been prescribed under rules made under the Northern India Canal and Drainage Act, 1873, has not been made an offence. If the payment is not made, it is recovered by the Collector as arrears of land revenue. Prima facie, the non-payment has no connection with public order, public order being considered in the sense which I have already discussed, namely the maintenance of public peace and tranquillity. But it is urged by the learned Advocate-General that incitement to the non-payment of dues such as are mentioned in the Special Powers Act may be acted upon, which action would compel the Government to use coercive process for their realisation, which process would be resented by the defaulters, which resentment would lead to resistance to the coercive process, which would result in violence and, therefore, in the disturbance of public order. To my mind, there are here too many presumptions which are not warranted. Remembering what Laski said in the passage already quoted, and remembering what the Supreme Court held in the black-marketing case ('Rex v. Basdeva') already noted, it may be stated that it is more than probable that barring extreme cases, the incitement to non-payment will not be obeyed, and even if it is obeyed will not lead to violence, and that in any case the connection between the incitement and public order is too far-fetched and problematic rather than clear and proximate. That a wide-spread agitation for non-payment of taxes and other dues mentioned in the Special Powers Act may sometimes lead to a disturbance of public order may be admitted. But what may happen in extreme cases is not the true test of the validity or constitutionality of a piece of legislation. The question is whether the impugned legislation covers acts which are innocent in themselves or which have no proximate connection with the disturbance of public order. If the impugned legislation covers such acts, the legislation would be bad even though it also covers acts which in extreme cases may lead to disturbance of public order unless the two kinds of acts can be separated. Let us suppose that the instigator were to clearly say that the payment of the liability may be refused or deferred, but that there should be no resistance to the coercive process of recovery or the enforcement of the liability. To my mind, such instigation cannot reasonably be said to threaten public order. The impugned section does cover such cases. Again, it can hardly be said that if one individual instigates another individual not to pay certain dues or to defer payment of a certain liability when there is no general campaign of non-payment and there is no incitement to a general disobedience of laws, there will be a threat to public order. Such instigation is also covered by the provisions of the impugned section, and therefore the section is unconstitutional because as it stands, it is not possible to make it applicable to those extreme cases alone in which there may be a threat to public peace and tranquillity. It may be that in the present case, Dr. Lohia delivered the speeches to which objection has been taken, in connection with a wide-spread agitation carried on by the party of which he is the General Secretary and in that case his action might be legitimately considered to be a threat to public peace and tranquillity. But that is immaterial. The validity of an enactment is to be judged with reference to the activities it prohibits or restrains and not with reference to the actions of the accused. 84. But it was urged that though these actions may be covered by the impugned section, the Act was never intended to be applied to such cases and in this connection reference was made to the provisions of Section 1 of the Act. Section 1 gives a discretion to the State Government to extend the other provisions of the Act by notification in the official gazette to any district or to any part of a district in the Uttar Pradesh. It was urged that this discretion shows that the Act was not intended to be applied to individual cases when there was no general campaign of non-payment of liabilities. What the intention of the Legislature was can be judged only by what is stated in the Act itself or in the statement of objects and reasons. It does not appear from the Act itself or from the statement of objects and reasons that the Act was intended to be applied only to such extreme cases. A similar argument was advanced before the Supreme Court in - 'Romesh Thappar's case, but it was repelled by the majority of the Judges, and Patanjali Sastri, J. (as he then was) delivering the judgment of the majority observed: "It was said that an enactment which provided for drastic remedies like preventive detention and ban on newspapers must be taken to relate to matters affecting the security of the State rather than trivial offences like rash driving or an affray. But whatever ends the impugned Act may have been intended to subserve, and whatever aims its framers may have had in view, its application and scope cannot, in the absence of limiting words in the Statute itself, be restricted to those aggravated forms of prejudicial activity which are calculated to endanger the security of the State. Nor is there any guarantee that those authorised to exercise the powers under the Act will in using them discriminate between those who act prejudicially to the security of the State and those who do not." "The law cannot be held valid because the language employed is wide enough to cover restrictions both within and without the limits of constitutionally permissible legislative action affecting the right." 85. But it was urged that in a case of this kind you must have regard to the opinion of the Legislature and when the Legislature thinks that an activity attempted to be prohibited by it is calculated to endanger public order, that opinion must be respected by the Courts. Undoubtedly, the Courts lean in favour of the validity of a legislative enactment and would strain every nerve, if that were legally possible, to hold that that enactment was valid rather than that it was invalid. But this principle can be applied only when the Courts are in a position to judge that this was indeed the intention of the Legislature. In the present case it is impossible to say that in enacting the Special Powers Act the Legislature considered that the activity which it sought to prevent was not in the interests of public order. The U.P. Special Powers Act (14 of 1932) was enacted when the Government of India Act, 1919, was in force. The sphere of legislative activity of the local Legislatures was not carved out under that Act as was done under the Government of India Act, 1935, and the local Legislature could make laws subject to the confirmation of the Governor-General on any subject relating to 'peace' and 'good Government.' These terms include the whole legislative field including matters not connected with public order. When the Act was made permanent in 1940 by the Governor in exercise of his powers under Section 93, Government of India Act, 1935, it was nowhere stated that the Governor considered the instigation to defer payment of liabilities or the refusal to payment of liabilities as a threat to public order. The matter covered by the enactment clearly falls under the various entries in List 2 of the Seventh Schedule of the Government of India Act, 1935. Entry 39 dealing with land revenue, Entries 40 to 54 dealing with taxes, rates etc., Entry 13 dealing with local authority, and Entries 20 and 21 dealing with agricultural rent would cover the entire legislation. It is, therefore, difficult to say that the Governor considered the Act to be in the interests of public order. A feeble argument was addressed on the basis of the Act being adapted by the President by the Adaptation of Laws Order, 1950, under Article 372 of the Constitution. Article 372 continues in force the existing laws but it clearly provides that such continuance shall be subject to the other provisions of the Constitution. The mere fact that the impugned Act has been adapted by the President does not, therefore, mean that we are not to consider its validity with reference to the other provisions of the Constitution. The only adaptation that was made in the Act was a formal one; instead of 'the Provincial Government' the words 'State Government' were substituted. This was done simply to bring the language of the Act in conformity with the terminology of the Constitution. A formal adaptation like this could hardly be said to involve a recognition by the President that he considered the Act to be otherwise valid or that the adaptation made by him showed that he considered that the prohibition contained in Section 3 of the Act was in the interests of public order. I do not, therefore, consider that in the present case there is before us the opinion of the Legislature as regards the Act being in the interests of public order. 86. On behalf of the petitioner it was urged that a clear and present danger test should be applied to cases like the present as has been the practice of the American Courts. In the view that I have expressed above it is not necessary for me to enter into any detailed discussion of this question. I have expressed my view on the point in delivering the judgment of a Bench of this Court in connection with a contempt case (see - Lakhan Singh v. Balbir Singh', AIR 1953 All 342 ). 87. Lastly, the learned Advocate-General urged that the impugned legislation was in the interests of morality. This was not urged before the Bench and the questions referred to me do not involve a consideration of the point. I, therefore, refrain from entering into a discussion of the matter beyond saying that in my judgment there can be no question of the impugned legislation having any proximate connection with morality. Instances in which great men of all ages have considered certain laws to be unjust are not wanting. The prohibition contained in Section 3 applies to payment of certain liabilities. These liabilities may or may not be considered to be just. If they are not considered to be just, though wrongly not so considered I cannot say that those who think like this and instigate people not to make these payments considered by them to be unjust are in any manner acting against morality. Morality and law are different conceptions. They cannot be equated. In my opinion the answer to the second question must be in the negative. Question No.1: The provision of S.3, U.P. Special Powers Act, 1932, making it penal for a person by spoken words to instigate a class of persons not to pay dues recoverable as arrears of land revenue, was inconsistent with Article 19(1) (a) of the Constitution on 26-1-1950. Question No.2: The restrictions imposed by S.3, U.P. Special Powers Act, 1932, were not in the interests of public order. 89. Let these answers be returned to the Judges making the reference. M. L. CHATURVEDI, J. :- 90. We differed on two points of law in this petition and referred them to a third Judge. The third Judge has now given his opinion and he has answered both the questions in favour of the petitioner. The result is that this petition must be allowed. We consequently allow the petition, hold that the petitioner's detention is illegal and we release him forthwith. The petitioner shall be entitled to receive from the respondents a sum of Rs.500/- as costs of this petition. 91. We certify that the case involves substantial questions of law as to the interpretation of the Constitution.